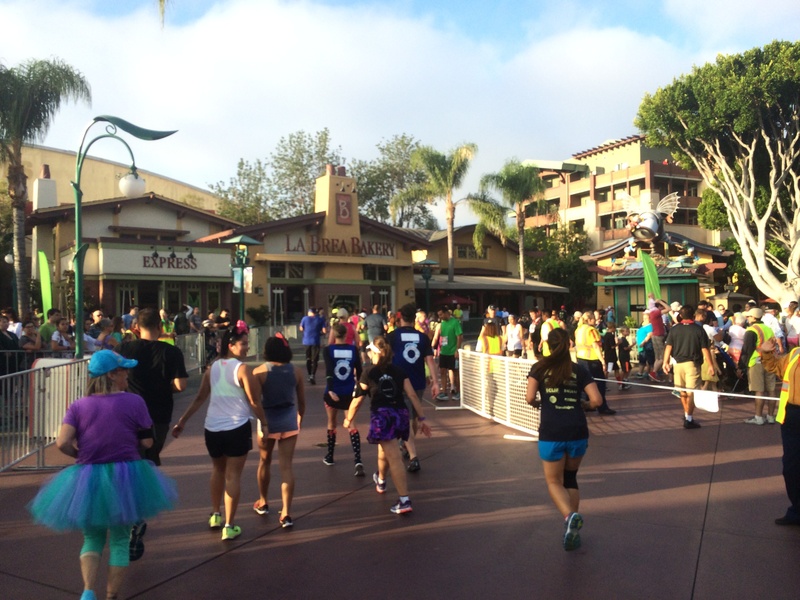 Welcome to the finish line of the 2014 Disneyland 10K! 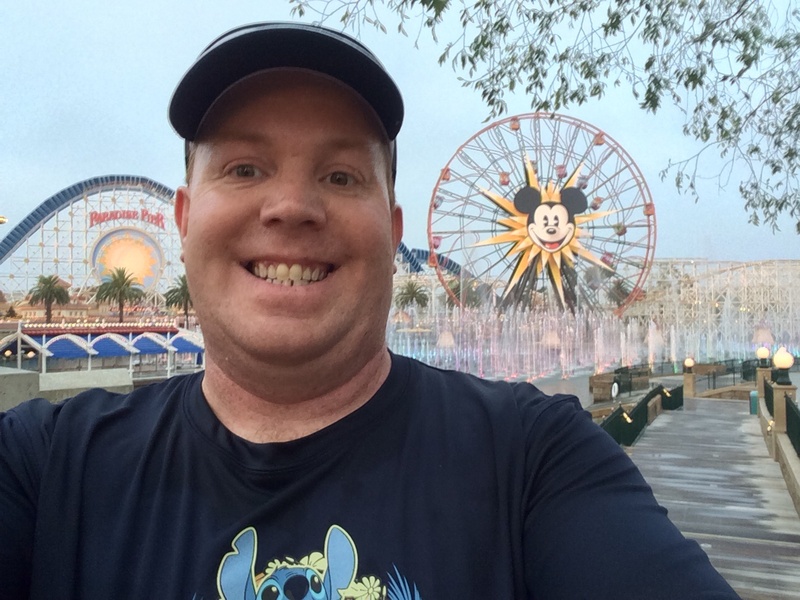 I was up at 0 Dark Hundred in the morning of the Disneyland 10K and ready for a meet up with my fellow Team #runDisney peeps. Brooke and I were staying at the Adventure Tower in the Disneyland Hotel. That meant, we were really close to where the meet up would take place. How close? Like a minute. 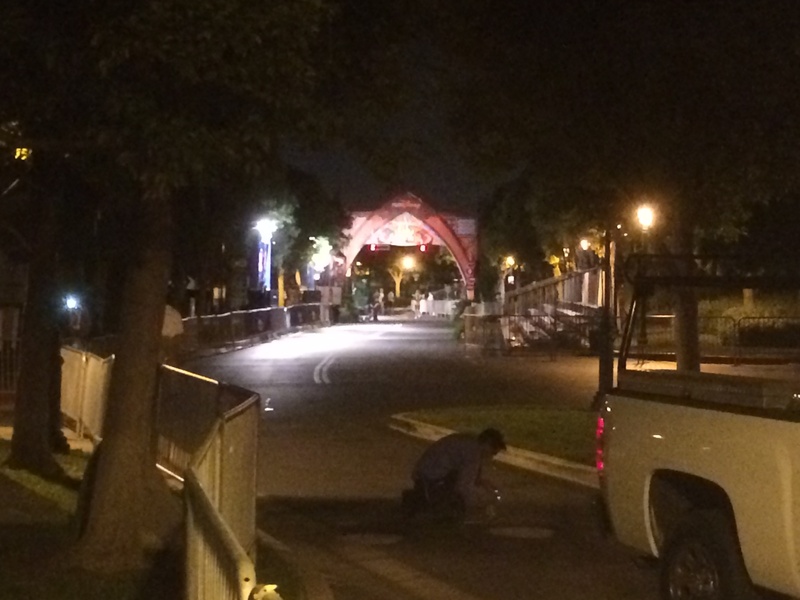 Since I got out earlier than I needed, I wandered up the road a little to grab a quick picture as the final touches were being applies to the finish area. 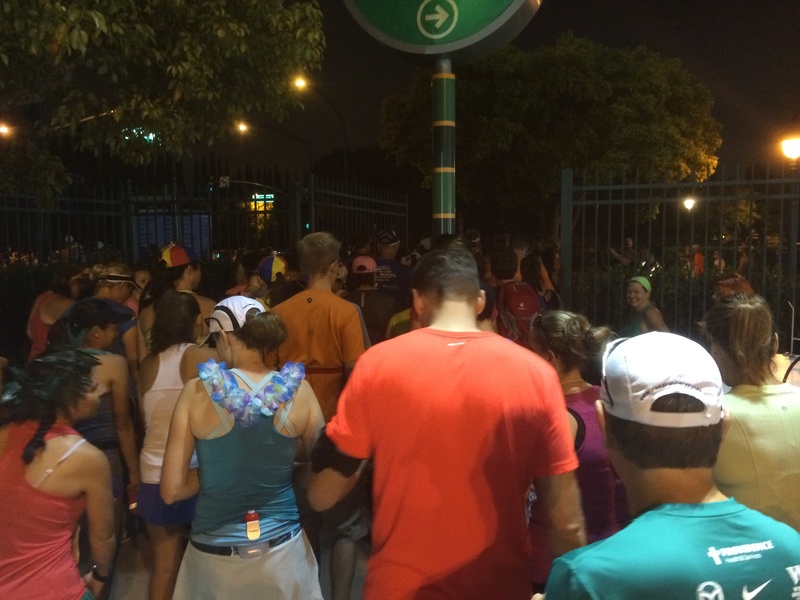 At 4am, I saw one guy wearing the Team #runDisney shirt and eventually more would arrive. It was fun chatting with the group. 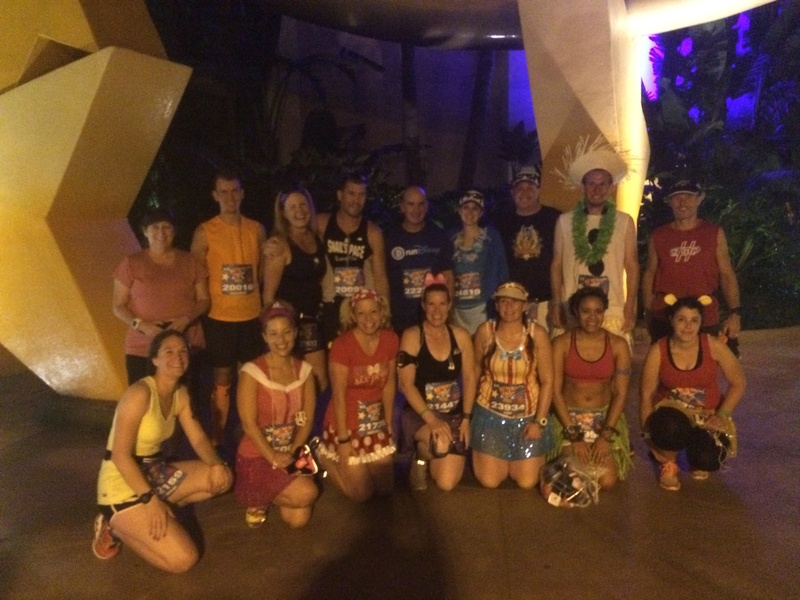 No matter how much fun it was, by 4:30, it was time for the group photo so we could head off to the starting corrals. Aren’t we a good-looking bunch of people? 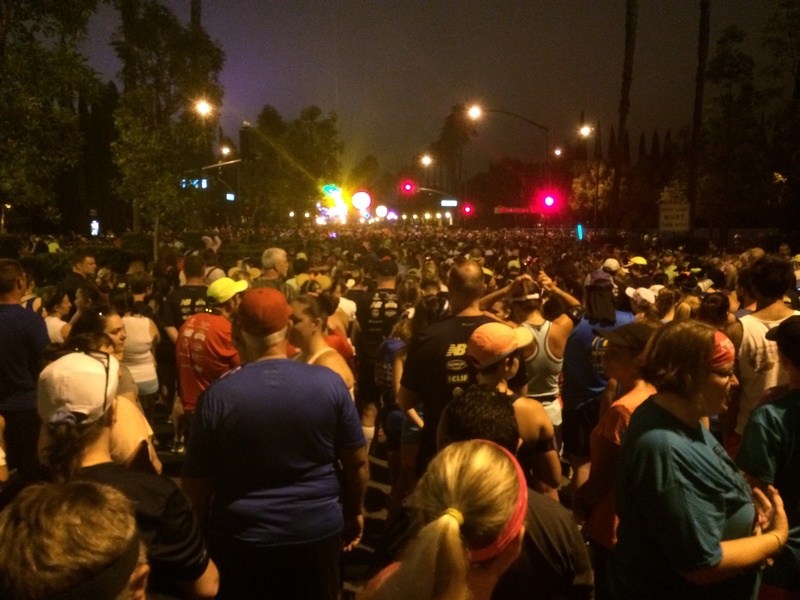 One of the members is fellow Pasadena runner Juliana who writes the 4 Well Rules blog. If you haven’t checked out her blog yet, you should. 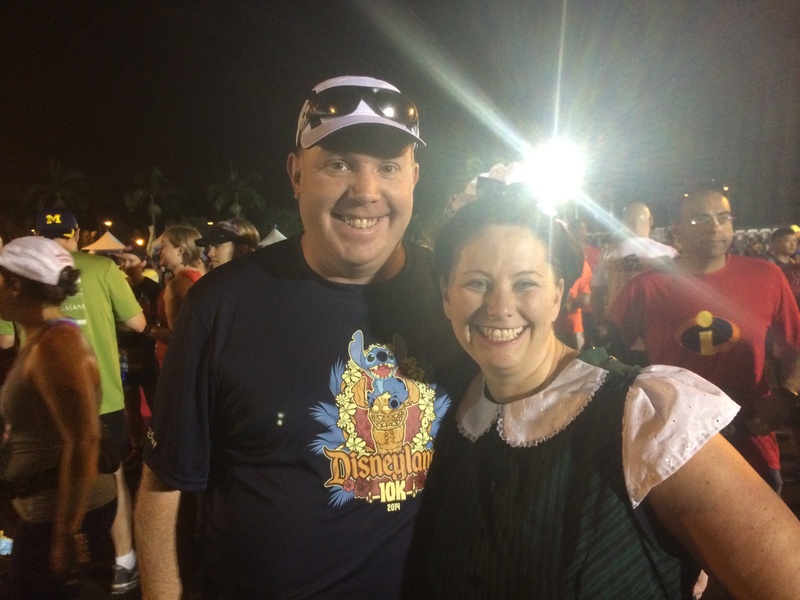 She’s a fellow Disney lover who also loves to run all the Disney races. It was good to see her without being out for a run! 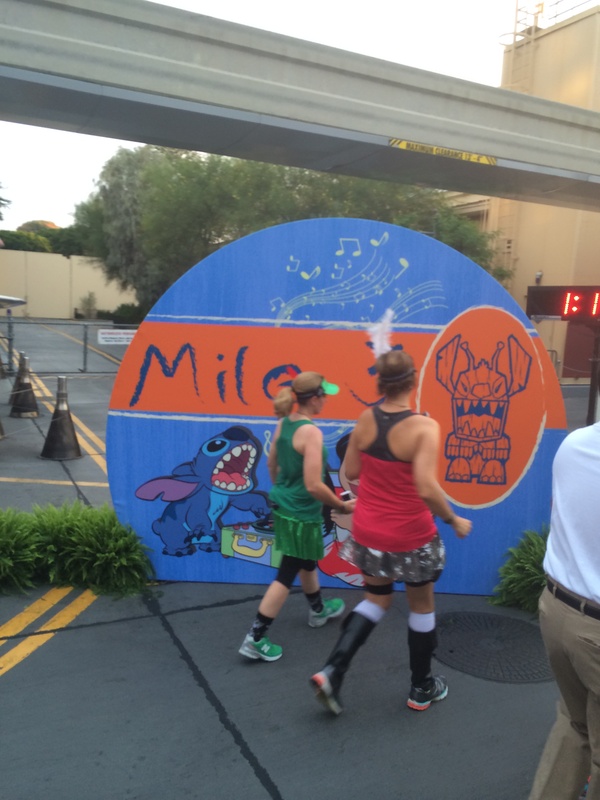 She was running the Dumbo Double Dare as well with a friend of hers (who was dressed as Olaf in summer for the 10K). 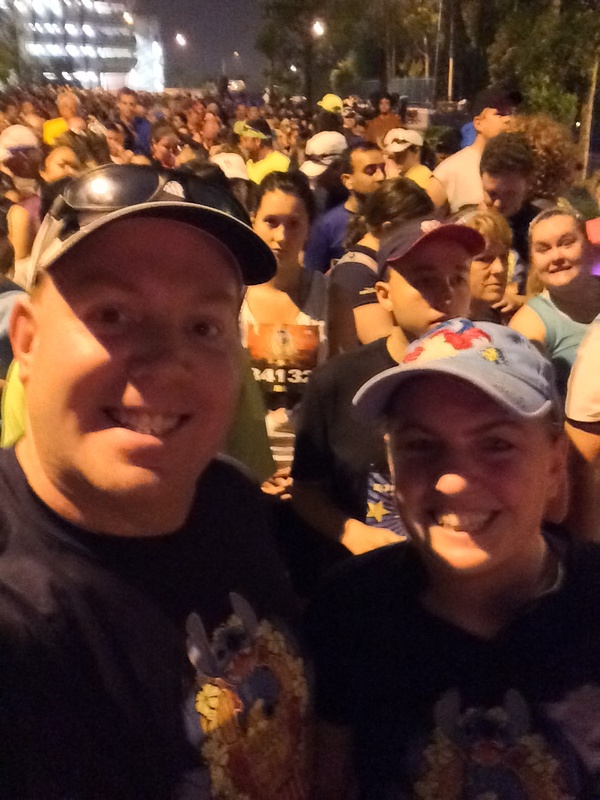 After the meet up, Brooke and I were off to the staging area for the races. We got there before they opened up the corrals. So, there was time for a quick photo. Brooke headed to the porta potties. As she returned, I ran into Patty from the My No-Guilt Life blog. Those of you who have been reading my blog for long enough, already know that I’m a huge fan of Patty’s blog. She’s a huge Disney and runDisney fan. So, if you want a really fun blog to read, head on over (if you haven’t already). 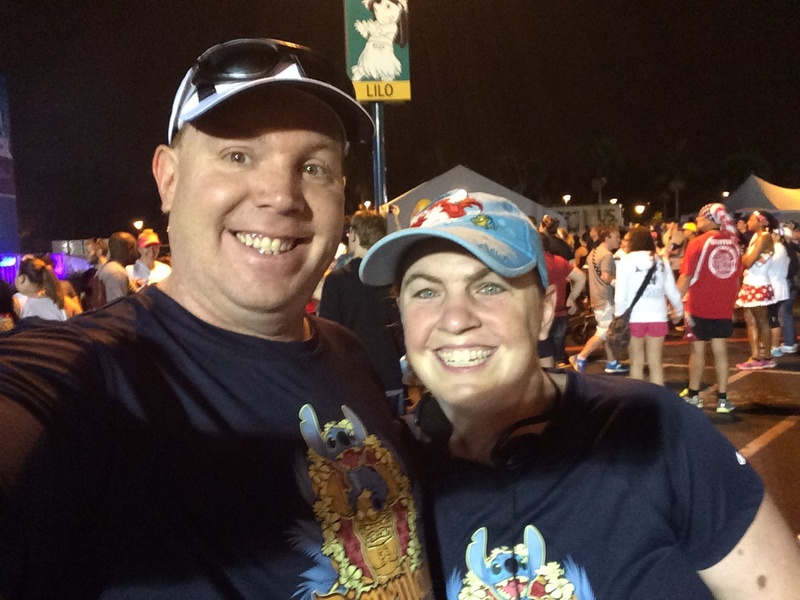 The cool thing for me about meeting Patty is that I hoped to meet her at last year’s Disneyland Half Marathon Weekend, but never did. 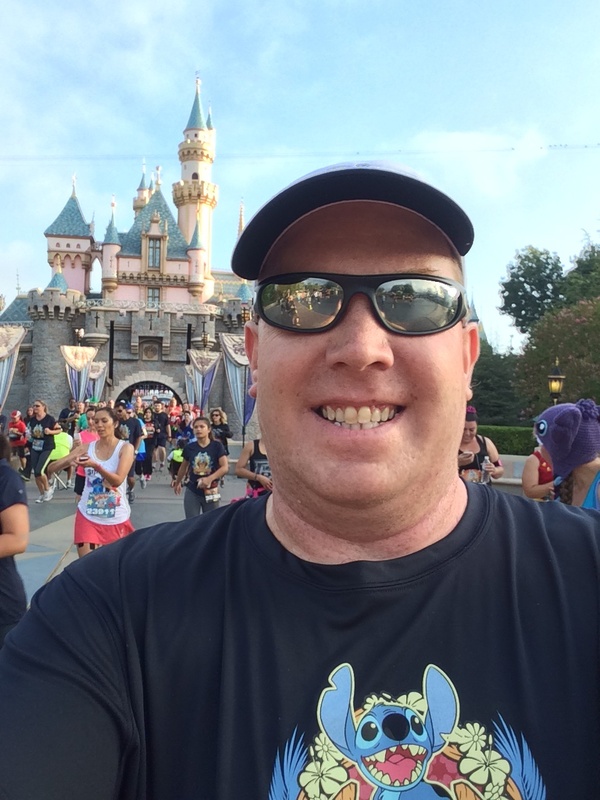 This year’s Disneyland Half Marathon Weekend would turn into what I had hoped last year would be. At the Expo, I got to chat with Kimberly Markey. 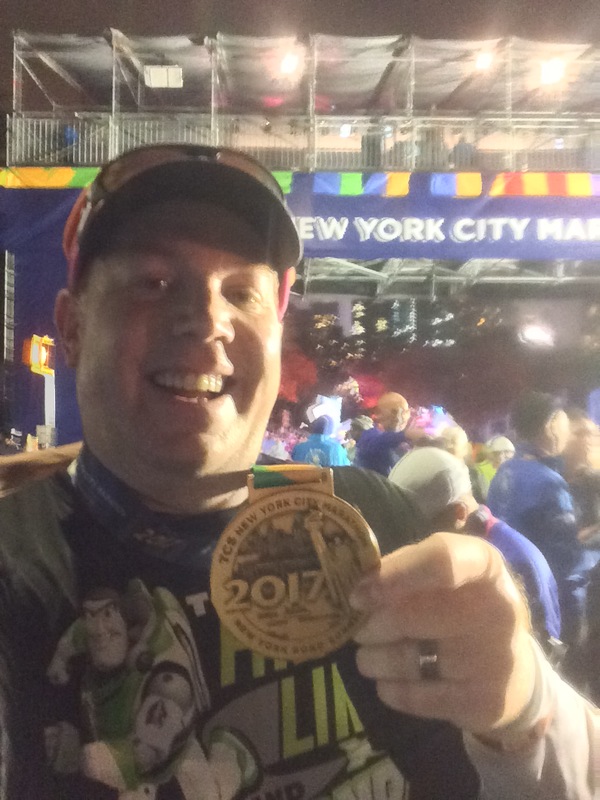 At the 10K, I got to finally meet Patty. It wouldn’t stop there. 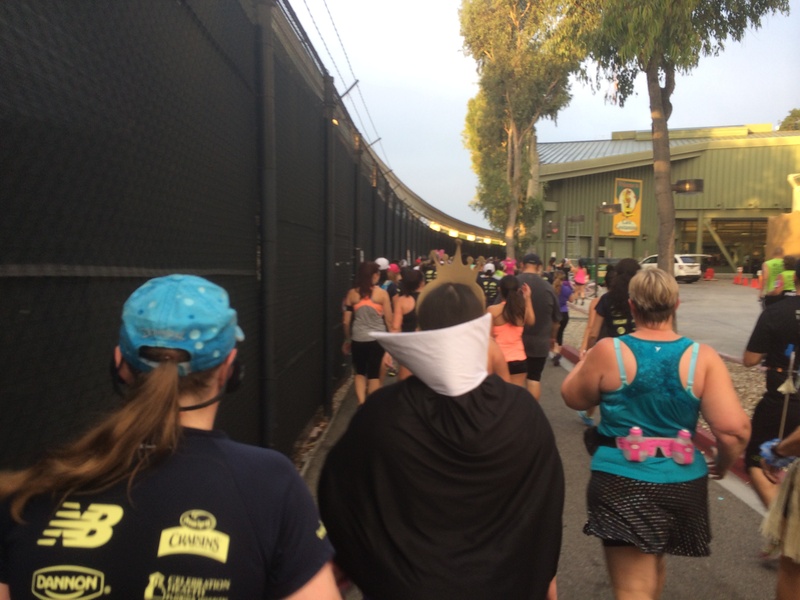 After meeting Patty, we were hoarded off to our starting corrals like cattle. Hmmm. Maybe that’s why they call them corrals? 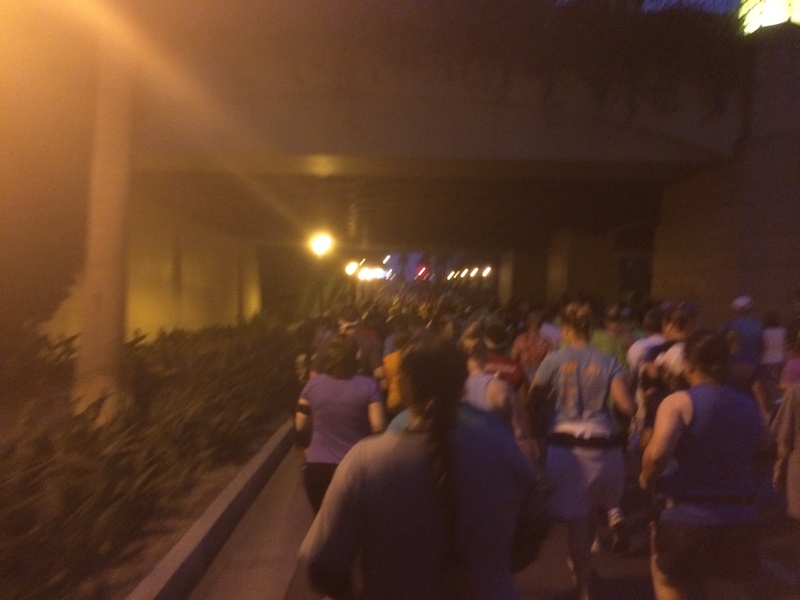 Without the Disneyland 5K before the 10K this year, getting into the corrals was way easier! 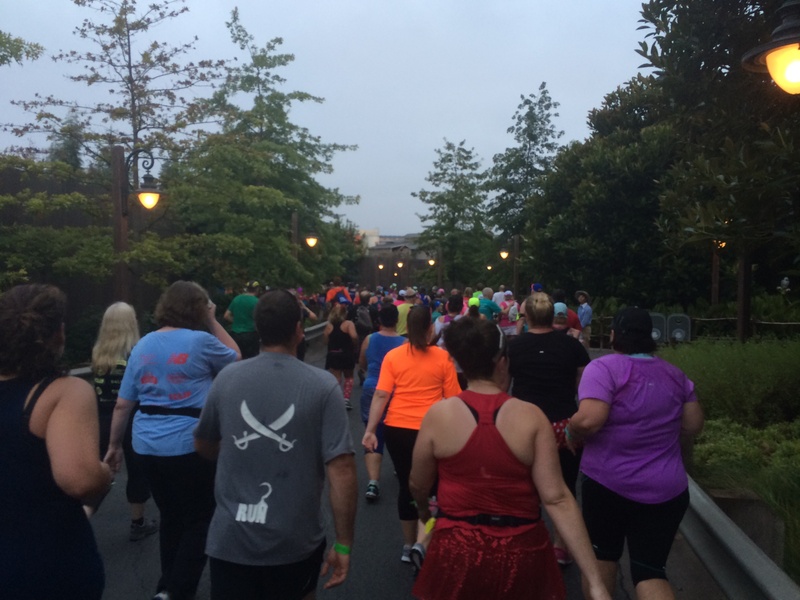 It was a brilliant move on runDisney‘s part to move the 5K to Friday morning! 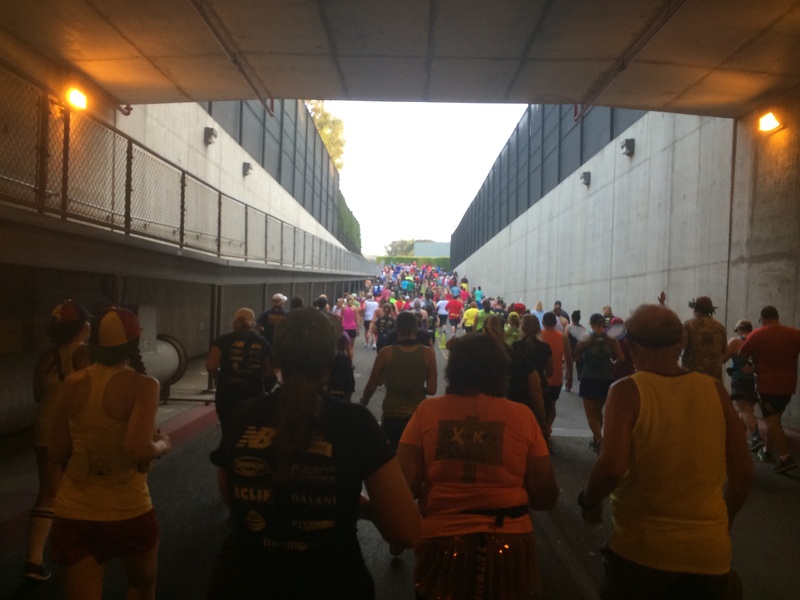 We arrived in the corrals and waited with 10,000 of our closest friends for the start of the race. It’s always fun to chat with those around you and hear their stories. 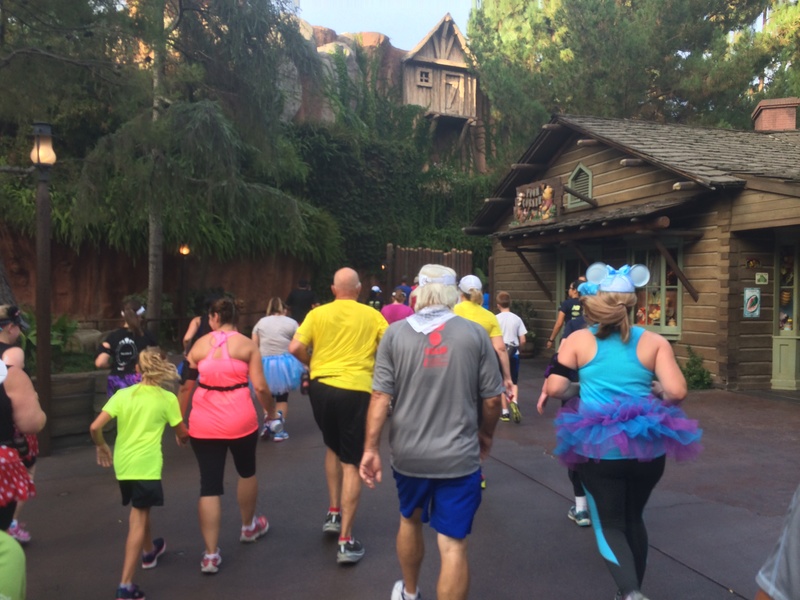 Runners can be great at telling their story of why they are running or why they are running at Disney. I honestly can’t get enough of the stories! Not only were there a lot of peeps ahead of us, but plenty behind us as well. 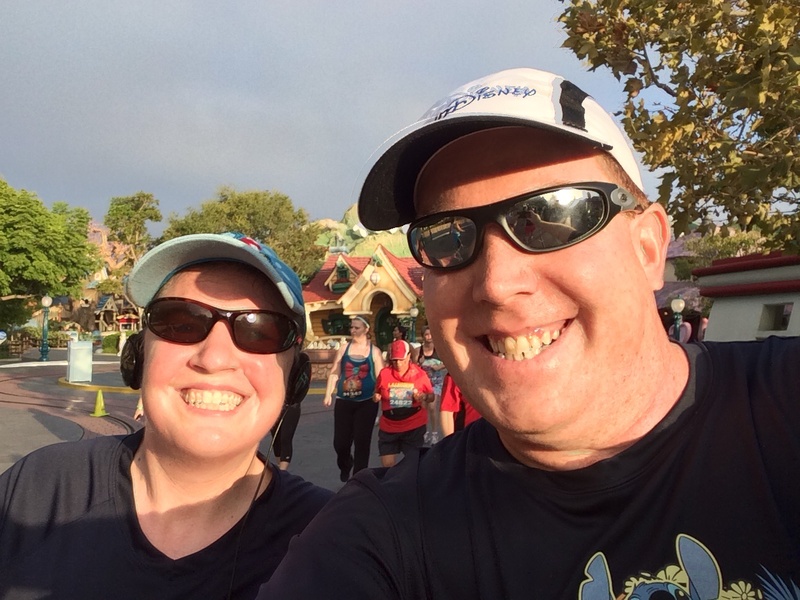 I was placed in corral D out of E. Brooke was in corral E. So, I dropped back because when I run a race with my wife, I want to be running with her the whole way. That’s the fun part! It took almost a half hour, but eventually, it was corral E’s turn to Go! 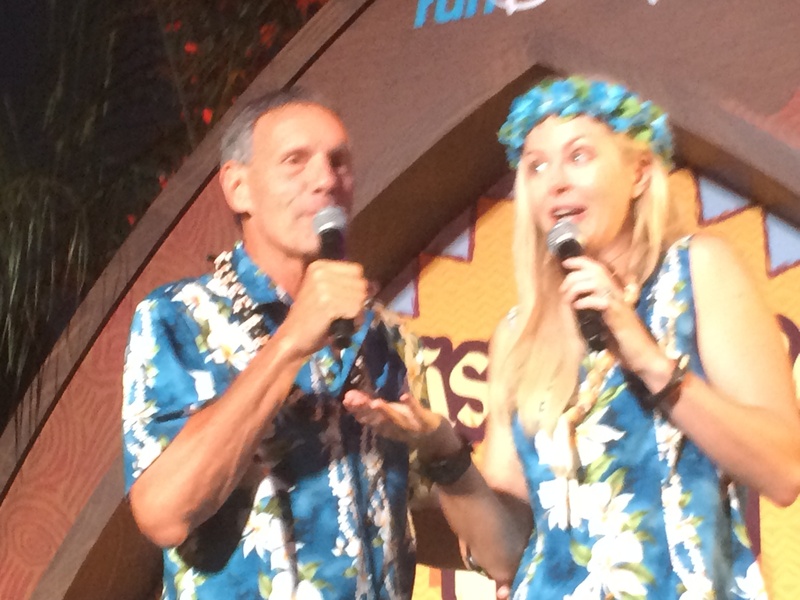 Rudy and Carissa were our race announcers again. 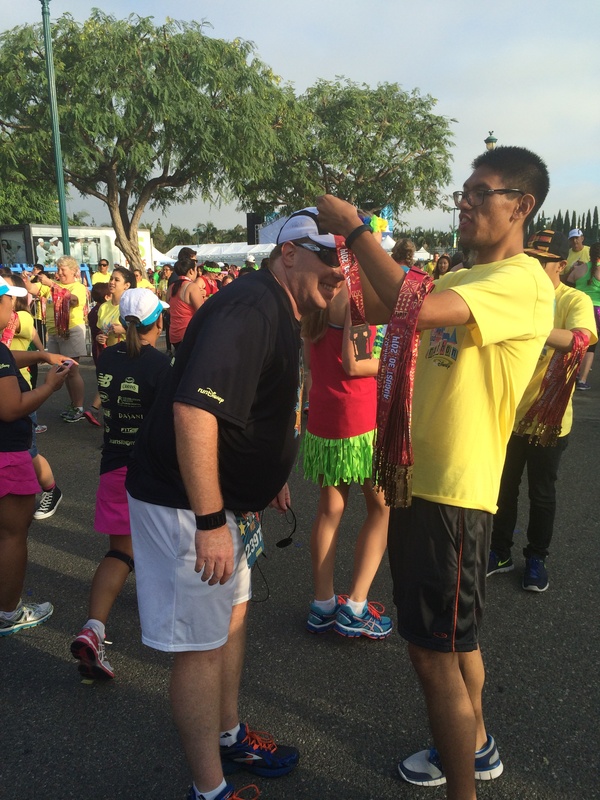 They are such a good team and keep us runners entertained and energized! 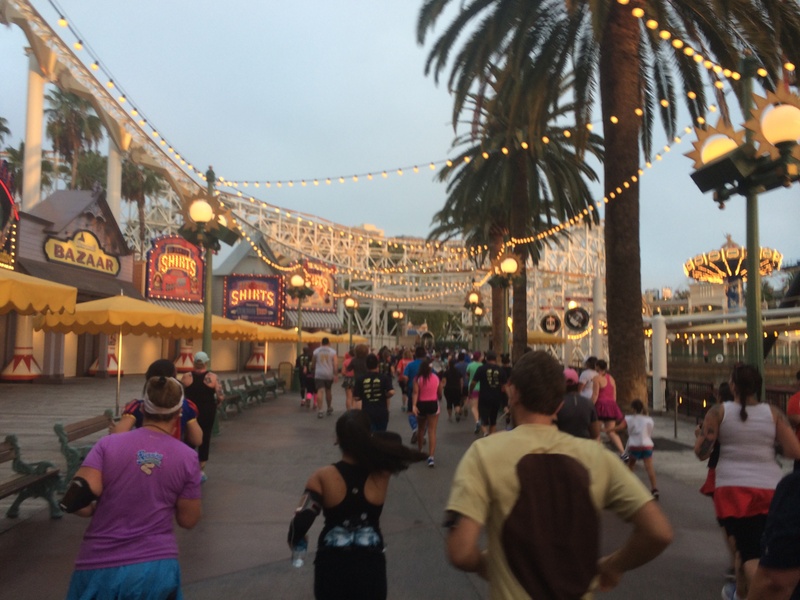 After passing Rudy and Carissa, we were off on the start of 6.2 magical miles through the Disneyland Resort! 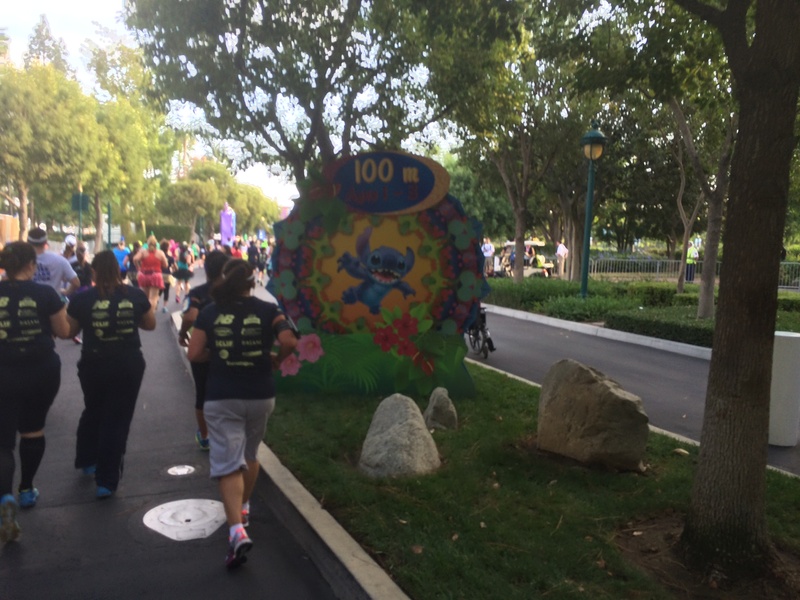 The race starts off on Disneyland Drive towards Katella Avenue. We continue on until the Anaheim Convention Center. 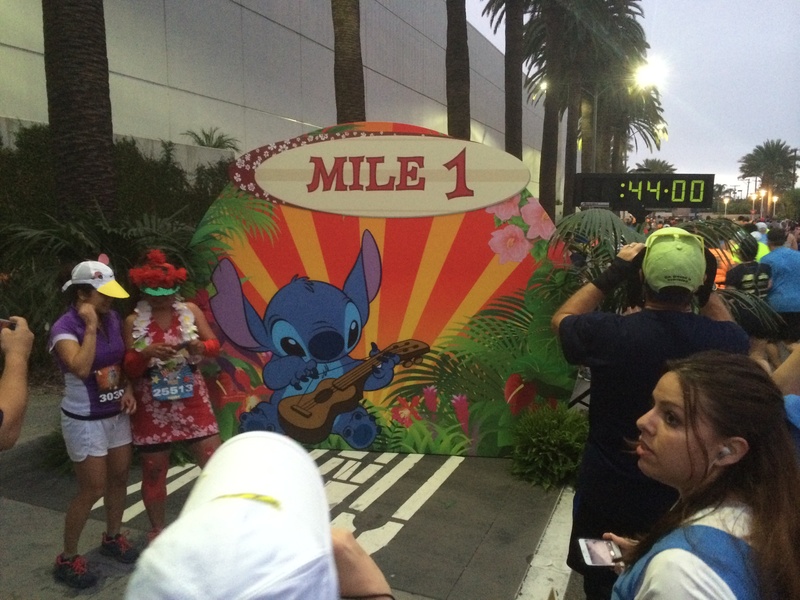 The route wraps around the Convention Center with the mile 1 marker on the entrance to the parking lot. The first mile went by so fast! Gotta love the Lilo and Stitch theme! Just past the 1 mile marker was the first of 3 or 4 water stops (I can’t remember exactly how many, but it was more than last year’s 2 stops). 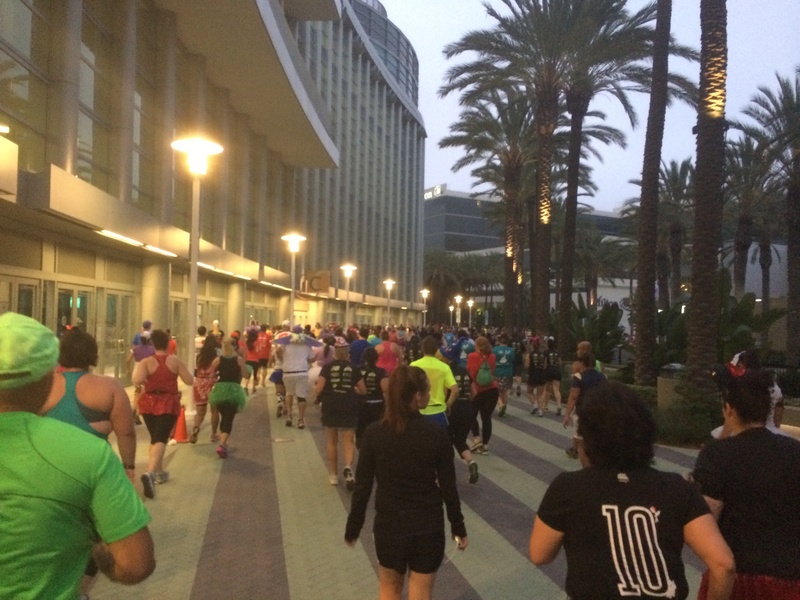 We then made our way to the main entrance to the Anaheim Convention Center. 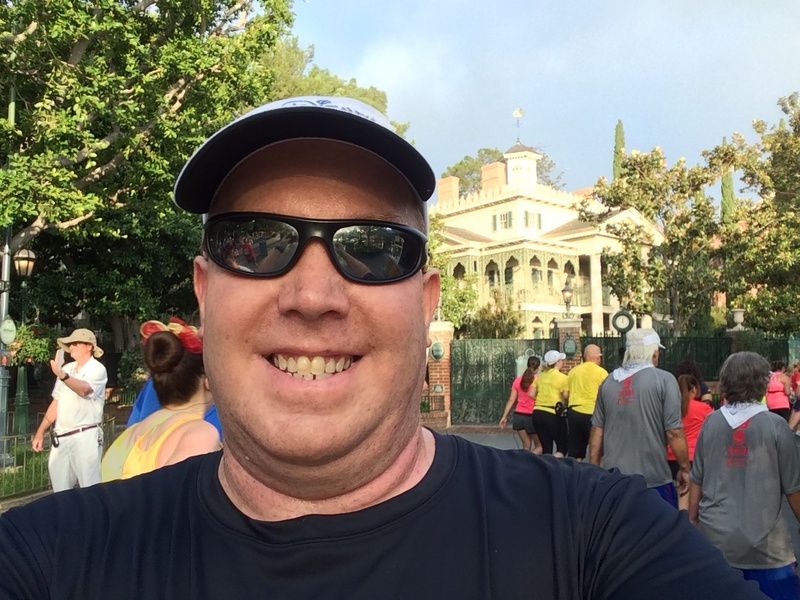 As we made our way up to Harbor Blvd., we saw my former PR professor who was out to run the half marathon. Her sister caught this picture as we passed the Anaheim Hilton. We would take Harbor Blvd, to Disneyland Way and turn around on our way to the back stage area of Disney California Adventure. Along the way, we crossed the 2 mile marker. We were getting close to being in the theme parks! As we entered the back stage area, we were greeted with by this cheer squad! This was definitely different from last year. 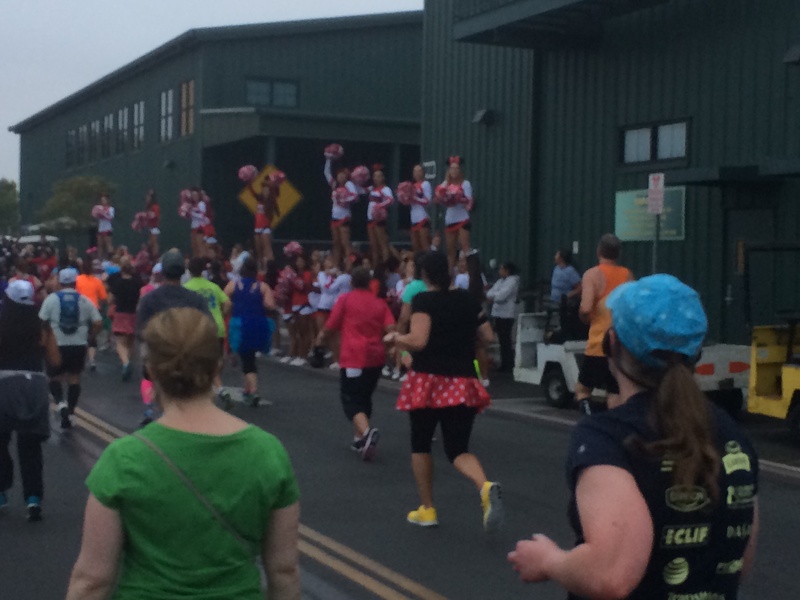 Usually the cheer squads are reserved for the half marathon. 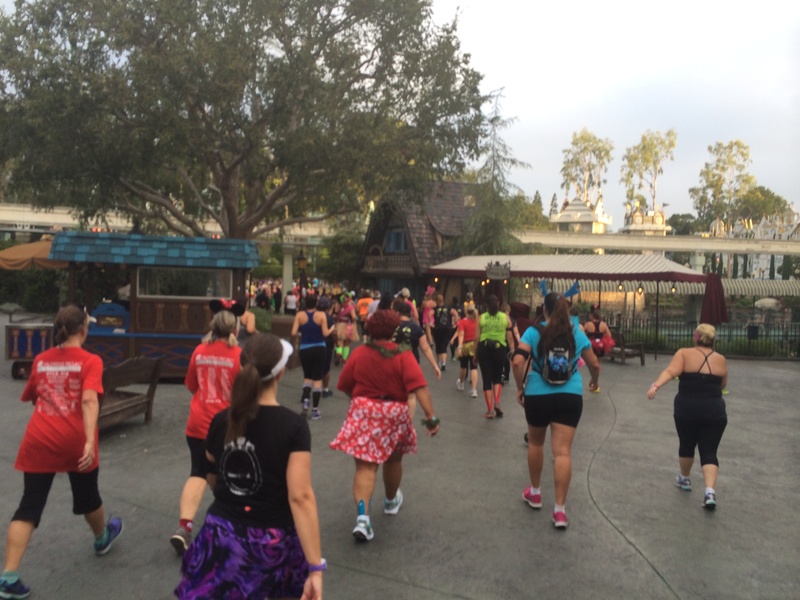 One funny story from this area…as we entered the back stage area, another runner asked a Disney cast member if a porta potty was close by. I told him that we were almost to Cars Land and he could use a real restroom just past Flo’s V-8 Cafe. He was very grateful for my information and asked if I knew this because I ran the 5K the day before. 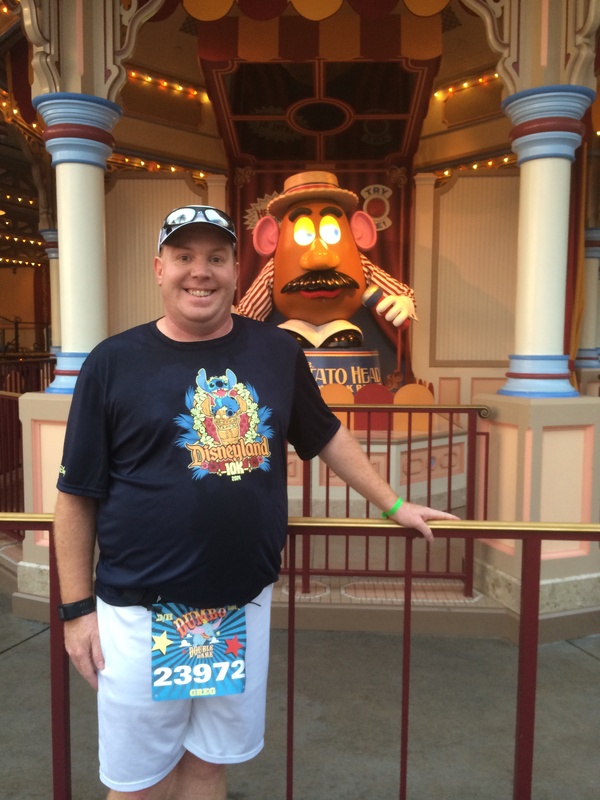 I told him that this was my second year running the Disneyland 10K. So, I already knew where the real restrooms were from last year. 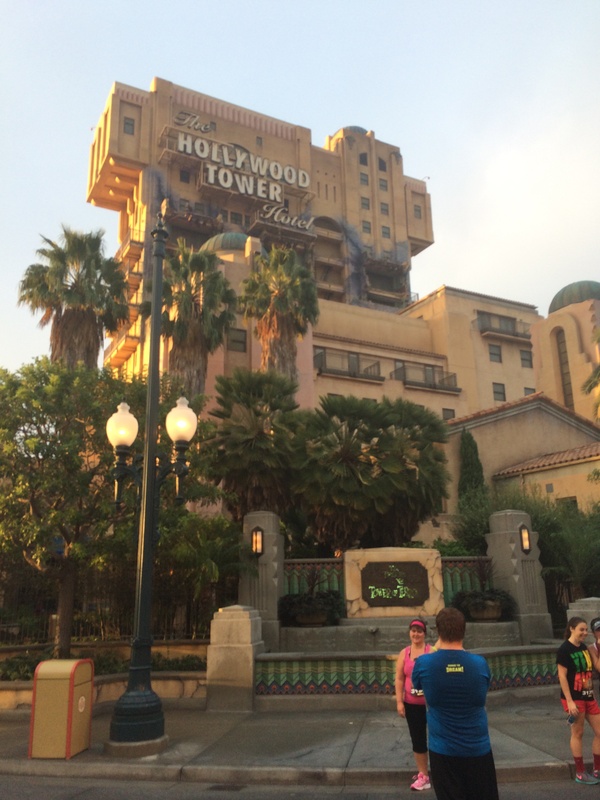 We would pass the Twilight Zone Tower of Terror on our way into Disney California Adventure. Finally, we are in Disney California Adventure! The first stop? 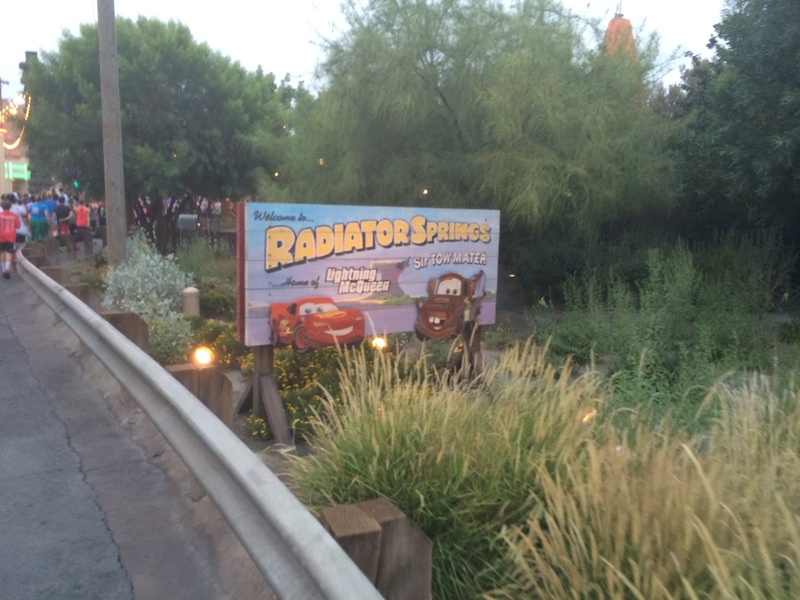 Radiator Springs…AKA Cars Land! Hello Mater! I thought about stopping for a picture but the line was just too long. Plus, Brooke was off and running. So, I wanted to stay with her. 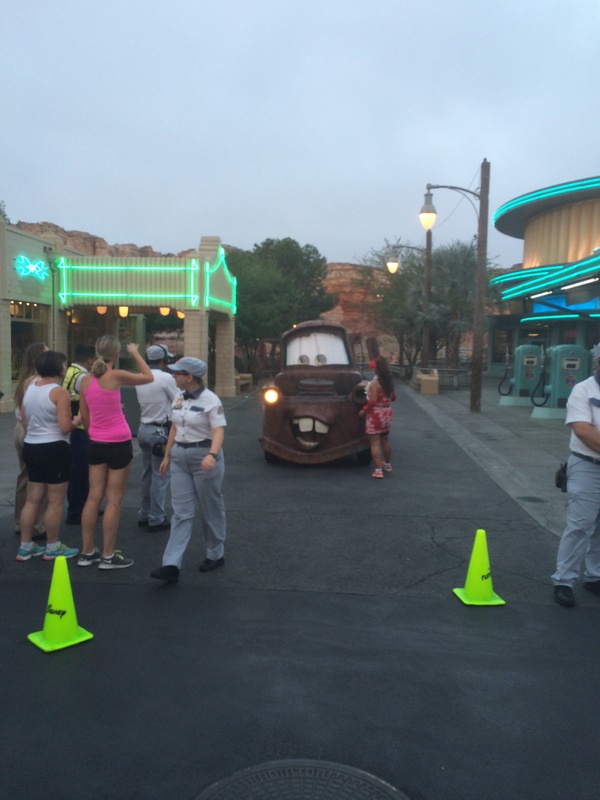 We ran up Route 66 to the other end of Cars Land. One thing that surprised me was that they split up Mater and Lightning McQueen. Mater, I got a picture of. Lightning McQueen was sitting by the Cozy Cones. Since I wasn’t expecting him, I totally missed a picture. Oh well. 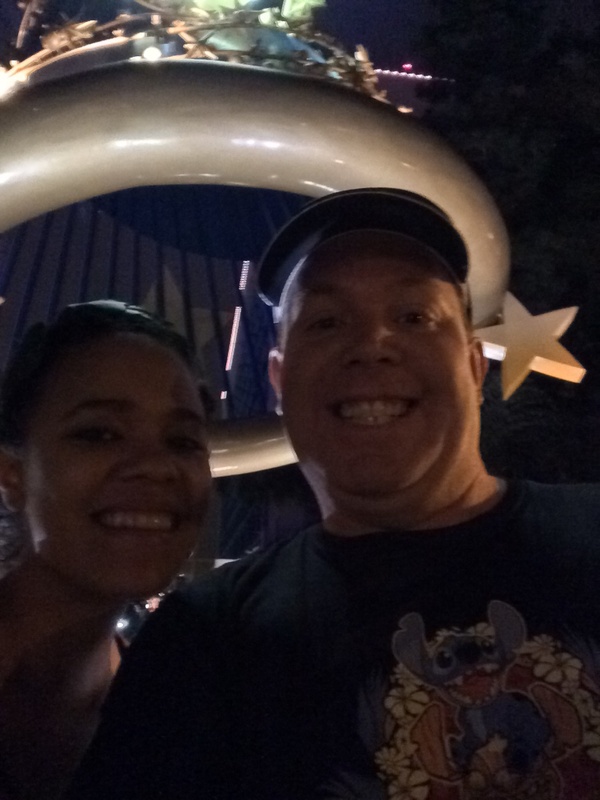 From Cars Land, we made our way to the Paradise Pier area. The more I see it, the more love the sight of Mickey’s Fun Wheel. 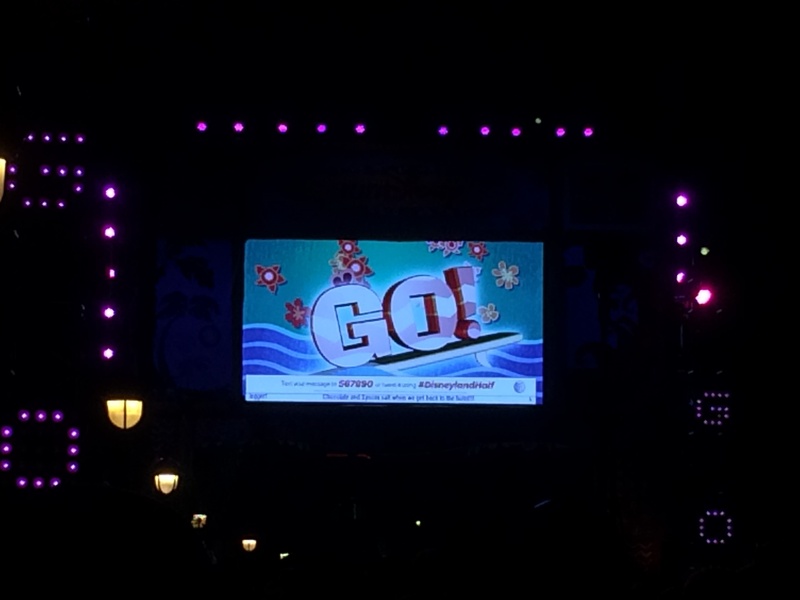 So, I had to grab a quick picture with the World of Color fountains! 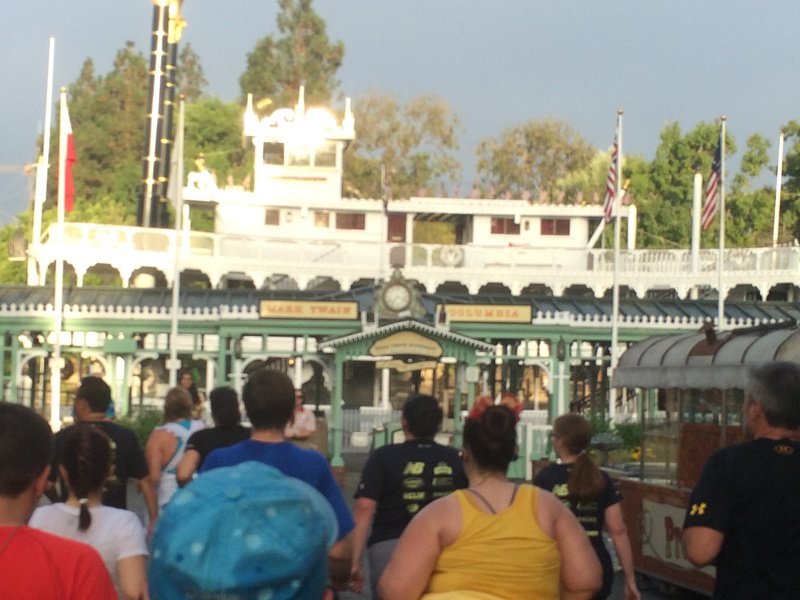 As I was finding my place for the above picture, I ran by Erica, my Walt Disney World Marathon pacer. It looked like she was pacing some others through the 10K. After this picture, I had decided to sprint ahead of my wife here because I wanted a picture with Woody and Jesse over by Toy Story Midway Mania. Unfortunately, they weren’t by Toy Story Midway Mania this year. All that we could get a picture with was Mr. Potato Head. Since I did sprint ahead, I decided to stop. Isn’t the Paradise Pier fun all lit up? On the other side of Paradise Pier, I did get Brooke to stop for this photo. We’d take our journey all the way around the Paradise Bay to the Little Mermaid: Ariel’s Undersea Adventure. The route would turn up towards Grizzly River Run and we saw a Elvis Stitch. Although, I thought it was kind of hard to get a picture with him. 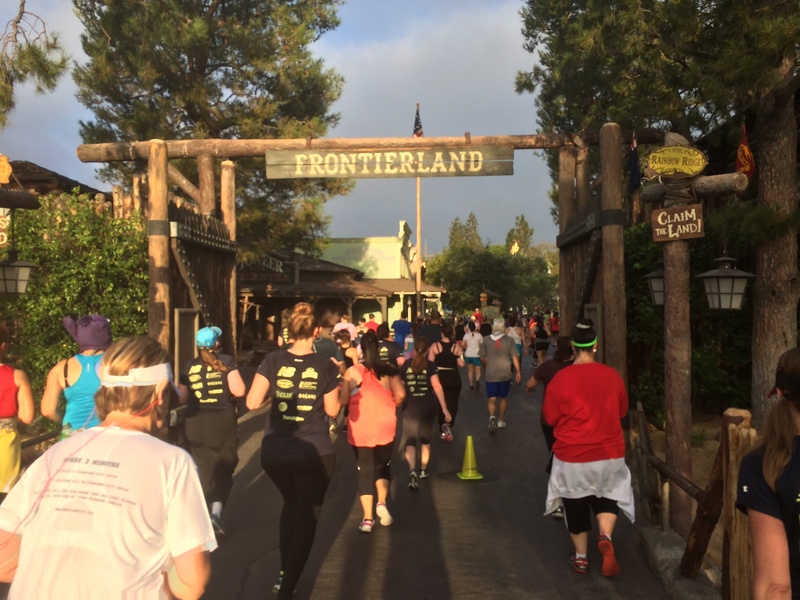 We wrapped around the Grizzly River Run, past the entrance to DCA from the Grand Californian Resort, and up towards the Condor Flats. 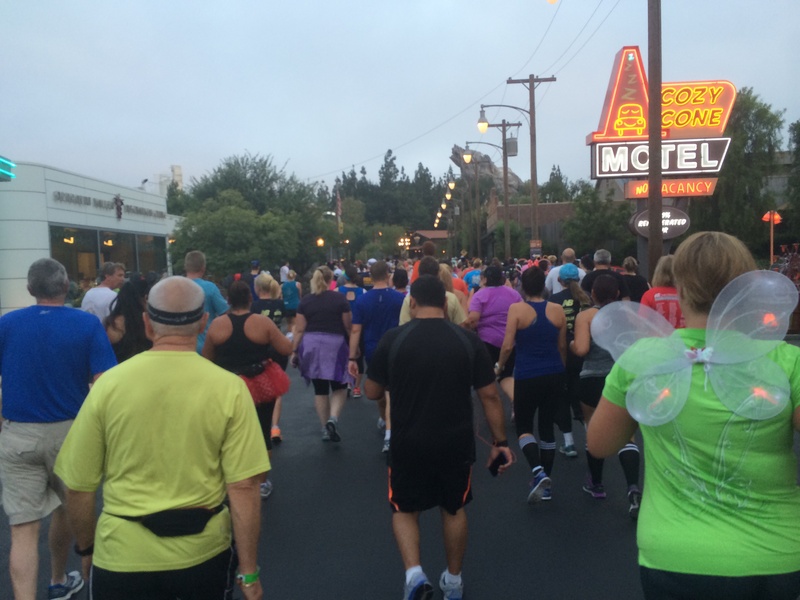 Right around Soarin’ Over California, we crossed the 3 mile marker! Almost half way done! 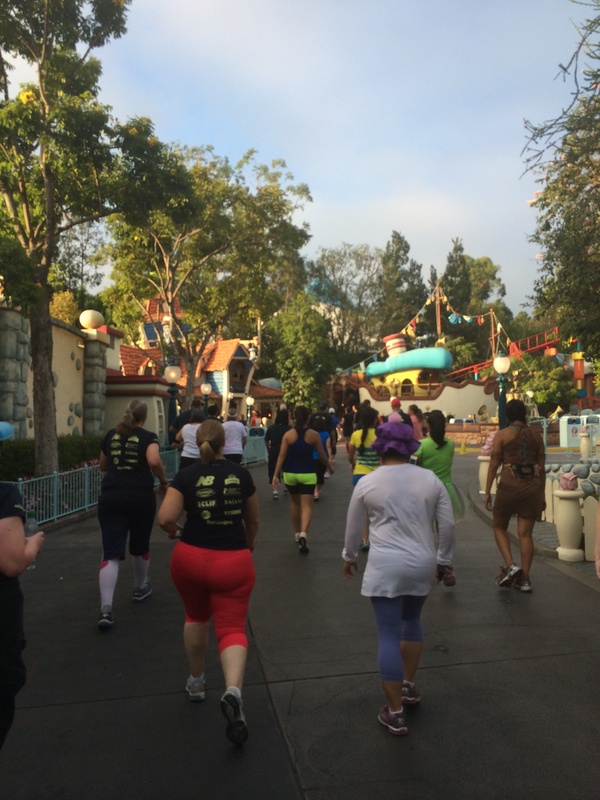 We headed towards the Carthay Circle Restaurant from there. 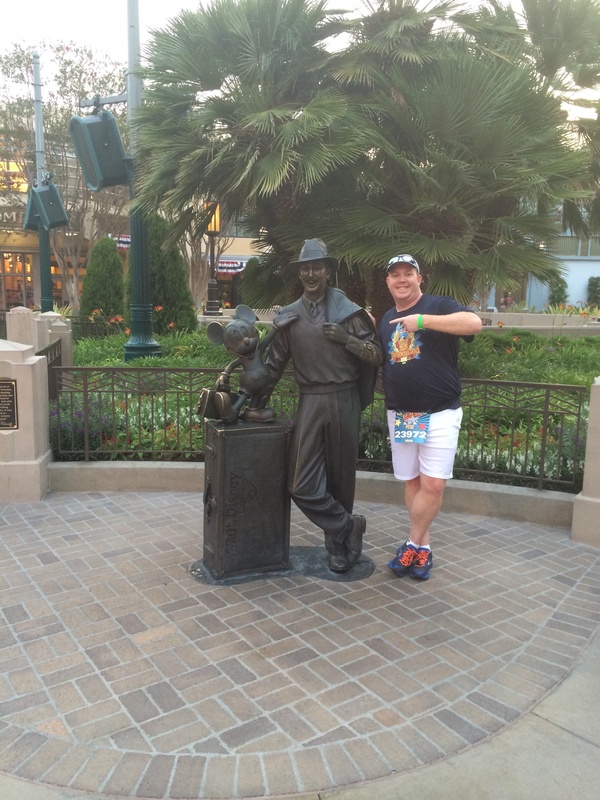 Last year, I got a picture with the Storyteller’s Statue. It came out a little fuzzy. So, I wanted to recreate the photo this year. Brooke didn’t want to stop. 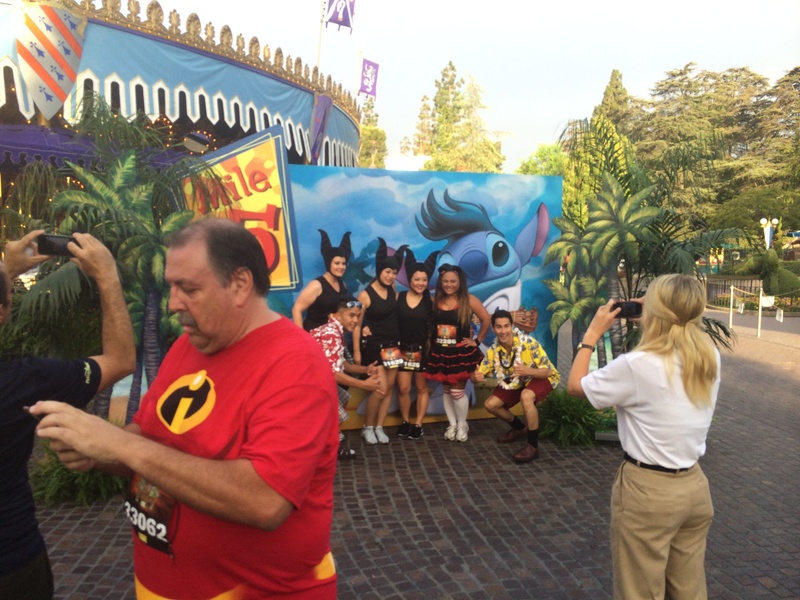 So, I was really glad they had a Disney cast member taking photos here! Then, it was through Hollywood Land. Last year, they had Sulley and Mike from Monster’s University along with the float from the Pixar Play Parade at the end of Hollywood Land. So, I sprinted ahead of Brooke to get a picture. Again, no such luck. See? Last year, the Monster’s University float was behind where I am in this picture with Sulley and Mike (and some Monster’s U cheer leaders). Not so this year. The lack of characters was kind of annoying. We turned up toward the Twilight Zone Tower of Terror. 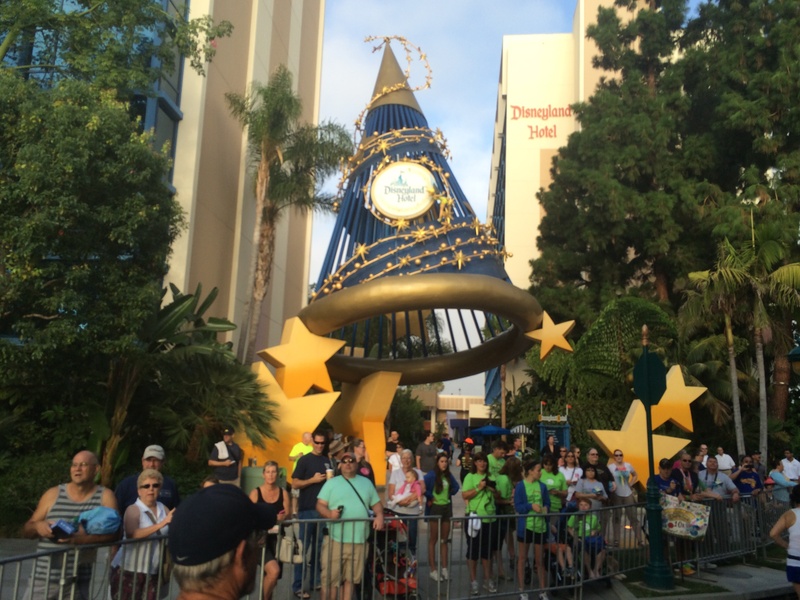 This time, we’d see the front of the attraction before heading backstage again. Once backstage, we headed towards this place where we’d go underneath a road. Only to have to go back up again. 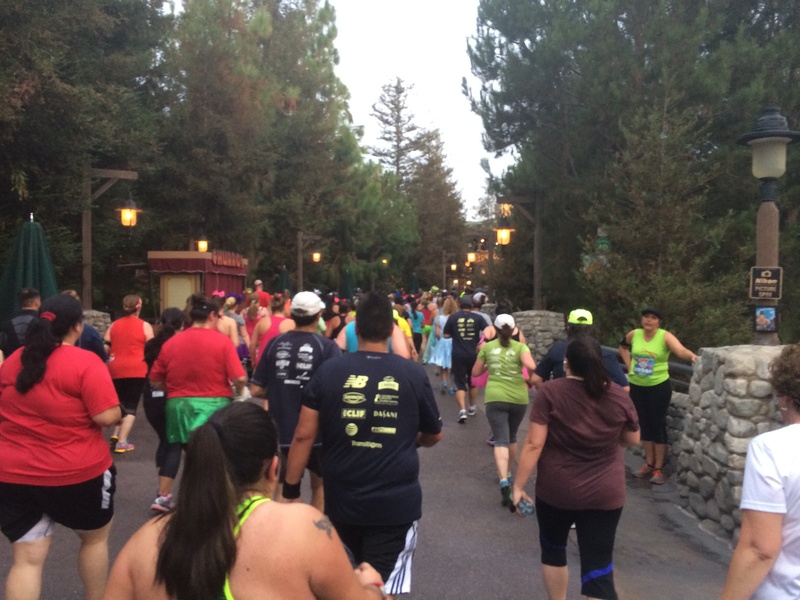 This was the one “hill” of the Disneyland 10K. On the other side, we’d enter the backstage area of Disneyland. We would head down this narrow path on our way to the entrance. I must admit, running in this area was kind of futile attempt as there was not much room to get around anyone and the path was narrow. Still, the path led towards our final theme park. Disneyland kept getting closer and closer. We would enter the park to the far right side. 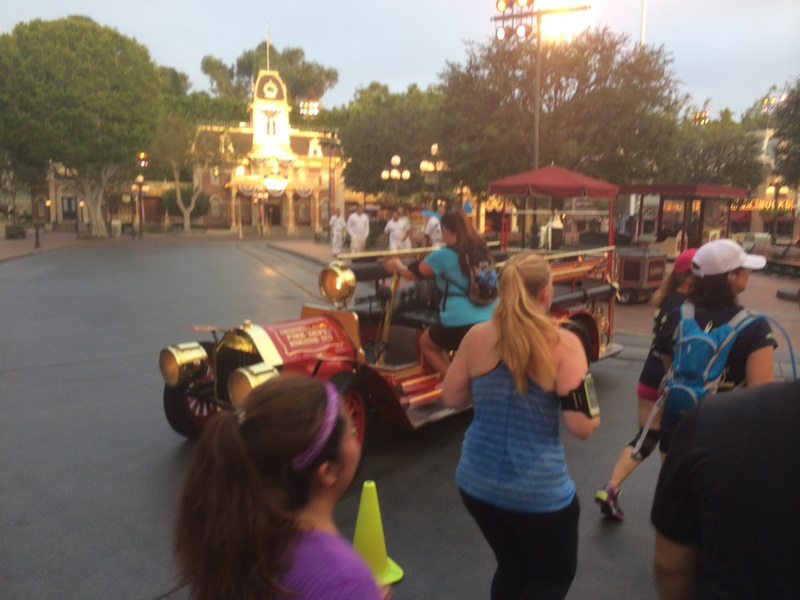 and finally onto Main Street U.S.A. Again, notice they had a main street vehicle you could get a picture with. However, there were no characters. Still, it’s fun to run up Main Street U.S.A. I’m sure the Walt Disney World runDisney regulars notice the lack of crowd support on Main Street U.S.A. Well, at Disneyland, you have to be a paying member of the ChEAR Squad to be in this location. 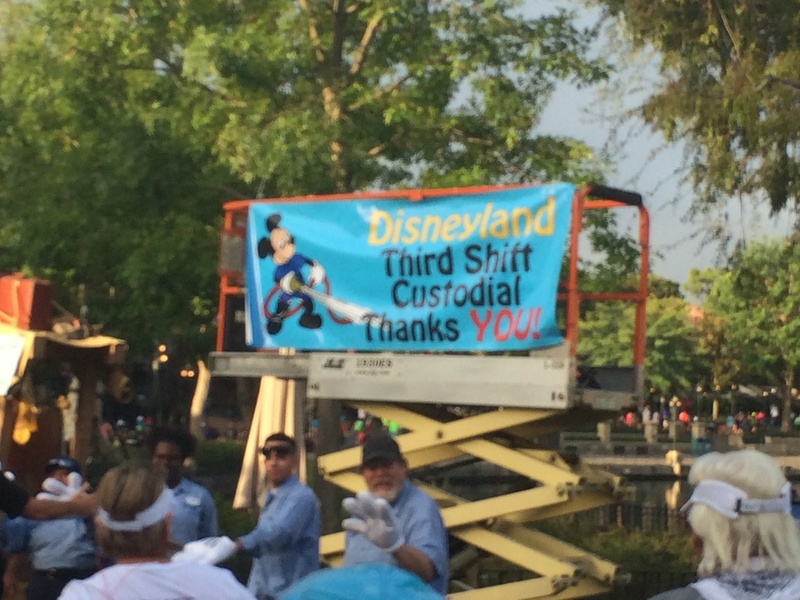 At Walt Disney World, you don’t. Thus, the difference. I would love it if they let folks onto Main Street U.S.A. at Disneyland like they do at the Magic Kingdom. 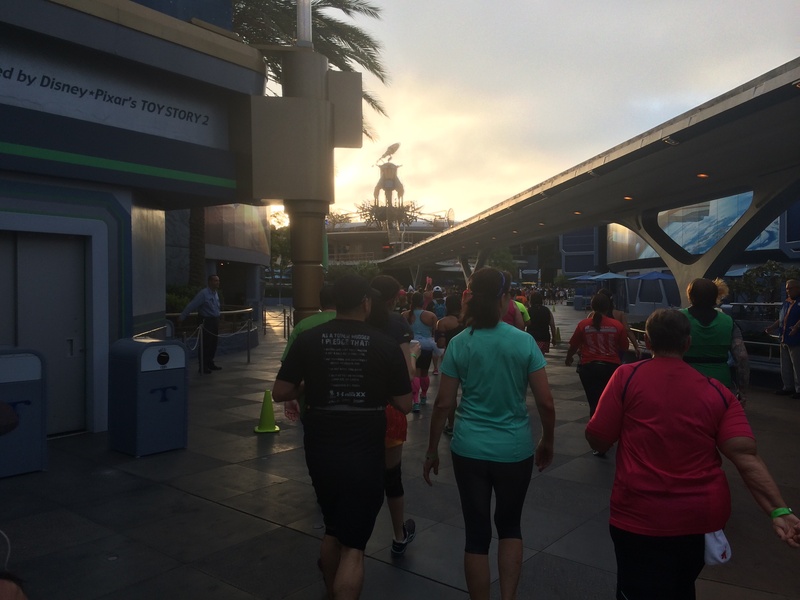 Once we got to the hub, we veered right towards Tomorrowland. Disneyland is my favorite place on the planet to be at. So, at this point of the 10K, I was pretty happy. 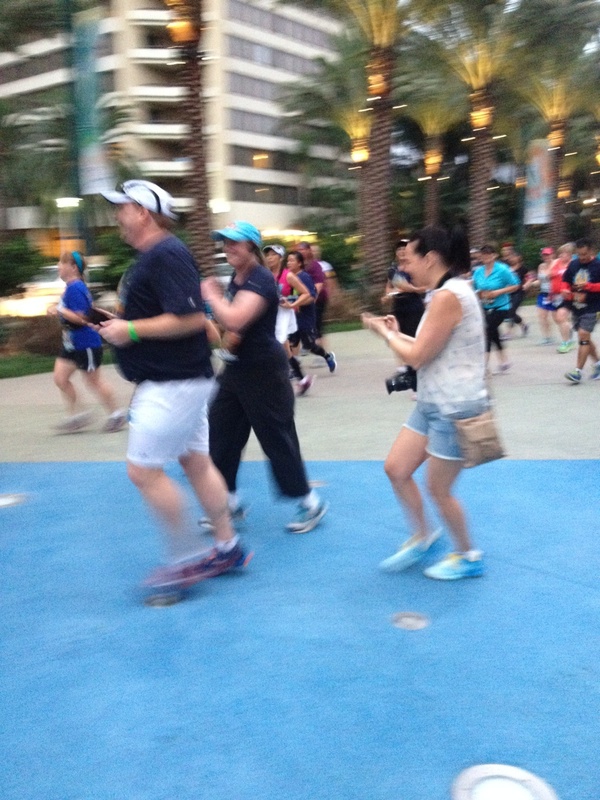 I wasn’t running for time and was having a blast taking lots of photos (if you couldn’t tell). We made our way through Tomorrowland. I was wondering if there would be any characters in Tomorrowland. Darth Vader? Storm Troopers? Buzz Lightyear? Nothing. 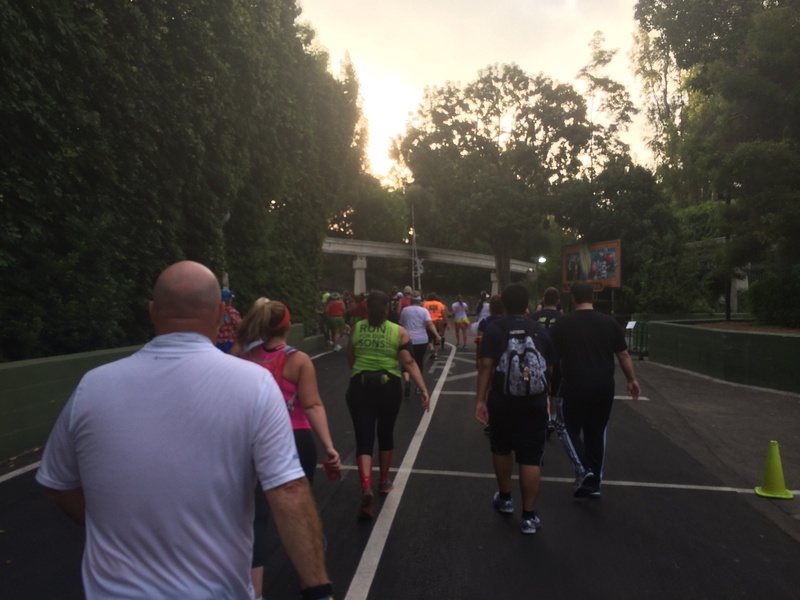 However, we did finish the 4th mile in Tomorrowland. 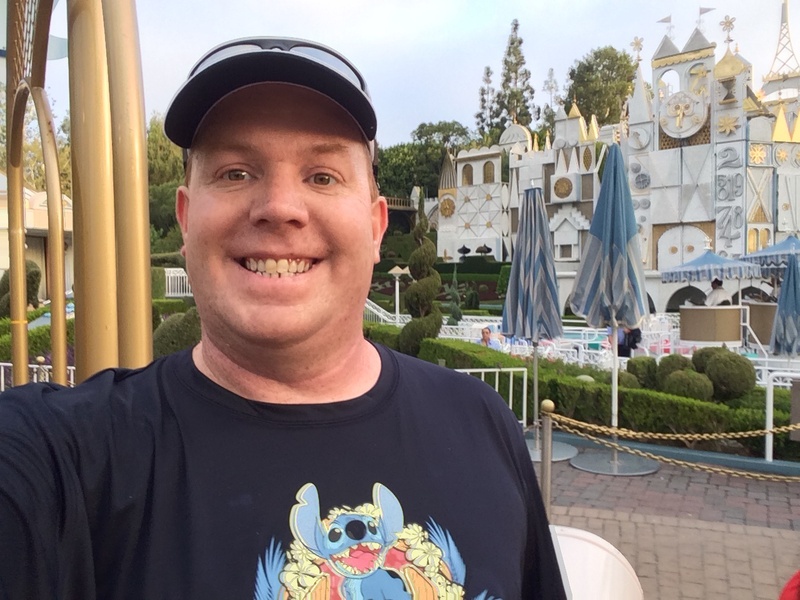 While I love the ambiance of Disneyland, it would have been even better if there were some character stops. 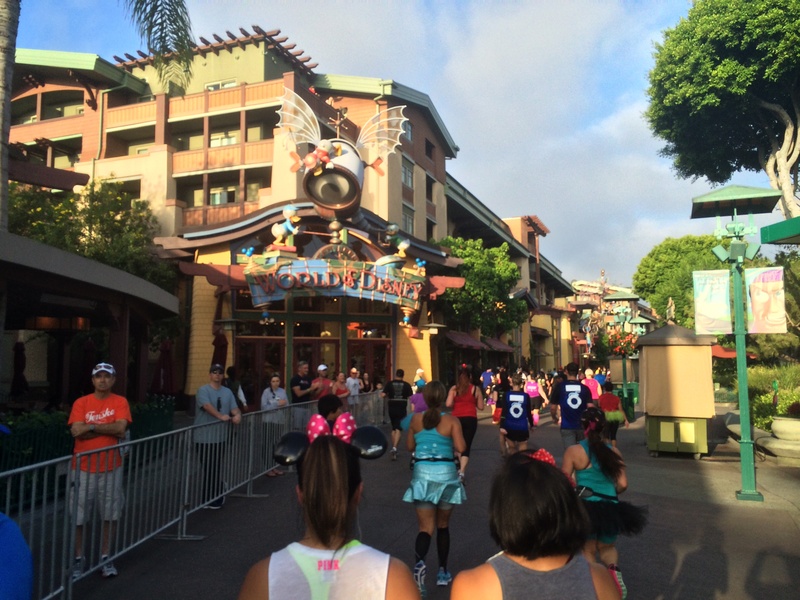 Especially for us Dumbo Double Dare runners who want to take the 10K as a fun race. 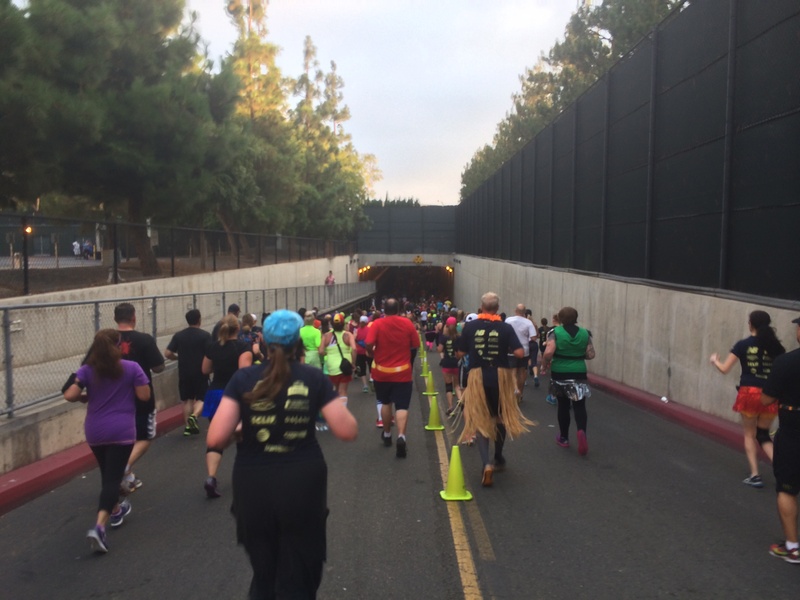 I did make a point to run through and high-five the Disneyland Cast members who were cheering us on right by the 4 mile marker. Most of them were wearing Mickey hands. 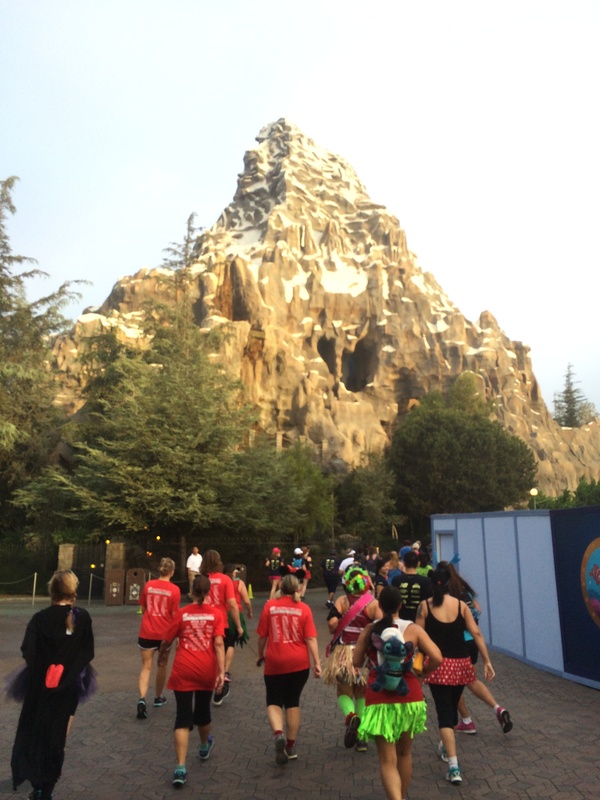 We would wrap around Tomorroland and head towards the Matterhorn. As we made our way towards the Matterhorn, I had this thought of the above photo. It came out pretty great. Don’t you think? It’s a Small World! I should mention that there was a character stop here. They had Chip and Dale. The line was HUGE!. So, I thought…no way I’m getting in that. Plus, Brooke wanted to be finished. So, no stops. I did grab this quick picture before heading backstage. 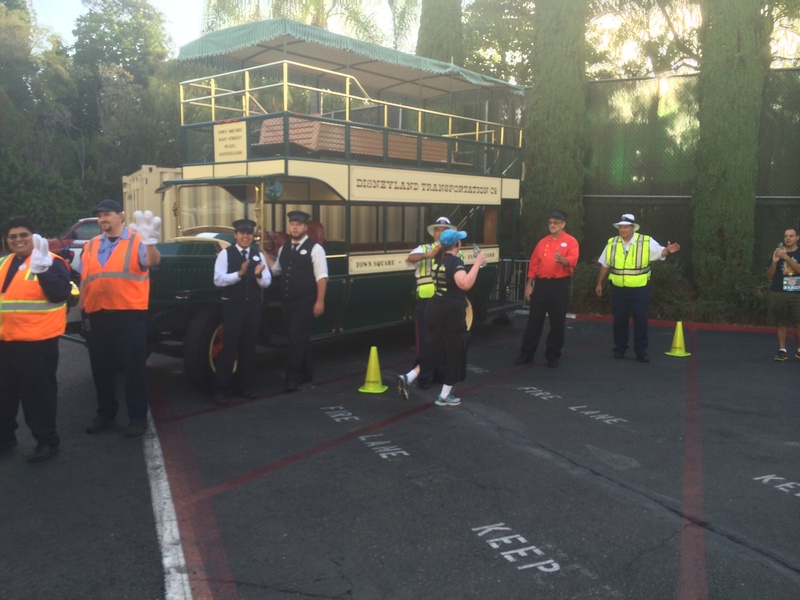 Here we are backstage at Disneyland. Have you ever wondered where the Monorail goes when the park is closed? Right here. This is also where the Disneyland Railroad train goes at night. 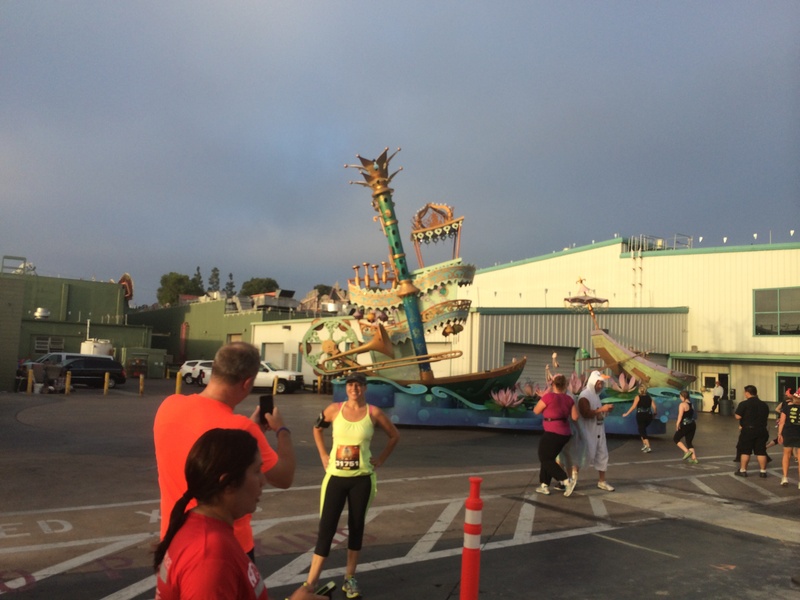 I love that the folks at runDisney set up floats backstage to encourage picture-taking. Of course, for regular Cast members, backstage photos are prohibited. Each time I get to run backstage at Disneyland, it’s a real treat because I can take the pictures I want to take during Candlelight. Passing by the Magic Music Days building always is special for me. So many memories of Candlelight Processional rehearsals in this building! More floats backstage. 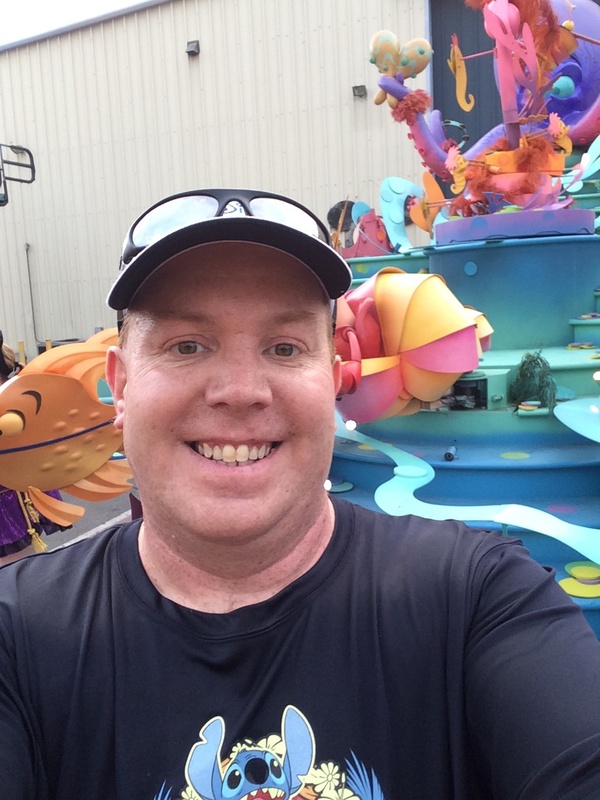 This time it was the Little Mermaid float from Mickey’s Soundsational Parade. Then, the Mary Poppins float. From there, we made our way into Toon Town. I really like the fountain in Toon Town of Mickey. Even without character stops, there is still plenty to distract us. By the time we got to Toon Town, the sun finally made its presence known. One thing I forgot to mention earlier. 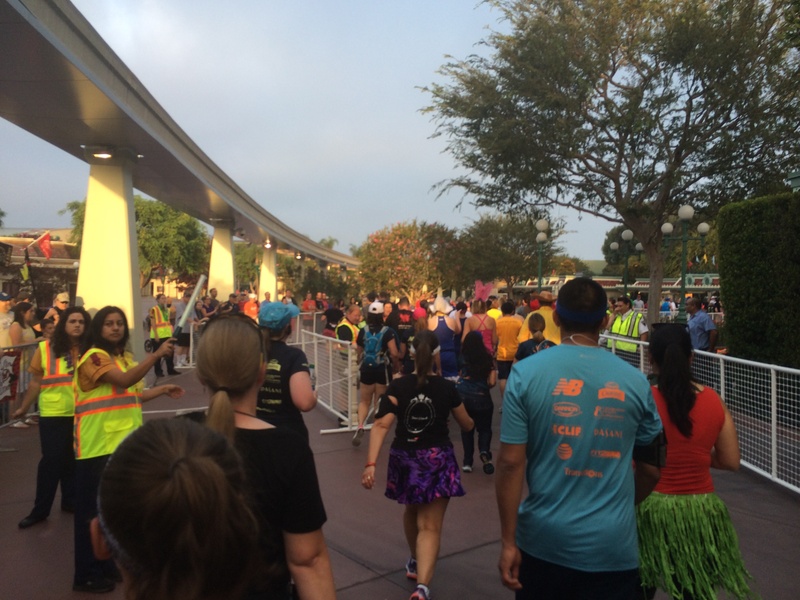 This race was run with much cooler temps than last year. Loved that part! 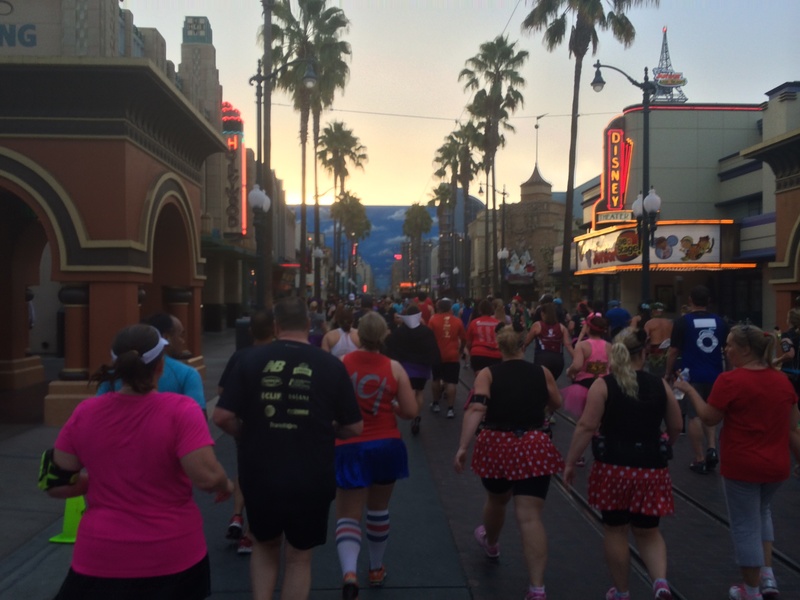 Anyways, Brooke and I were enjoying this race and had fun running through Toon Town. From Toon Town, we went back by It’s a Small World and through a pretty narrow path towards Fantasyland. 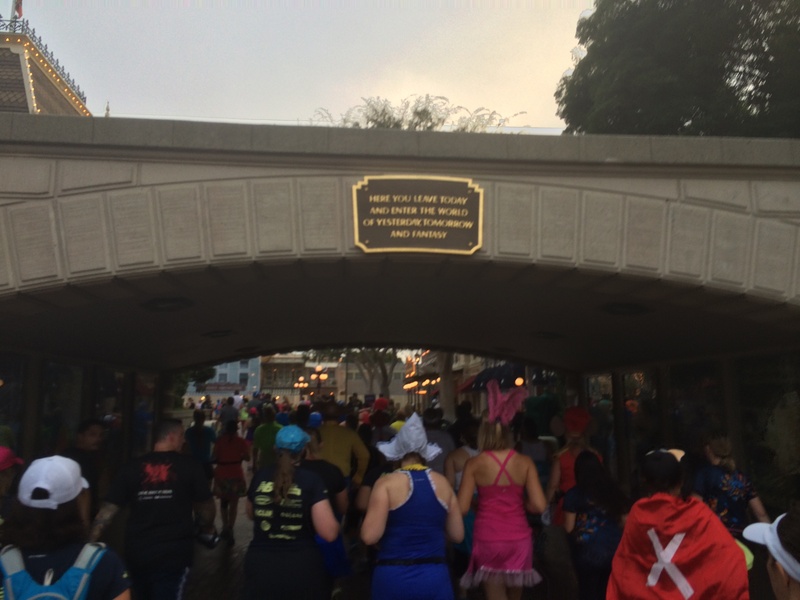 Right by the King Arthur’s Carousel, we came to the 5 mile marker! Only 1.2 miles left! 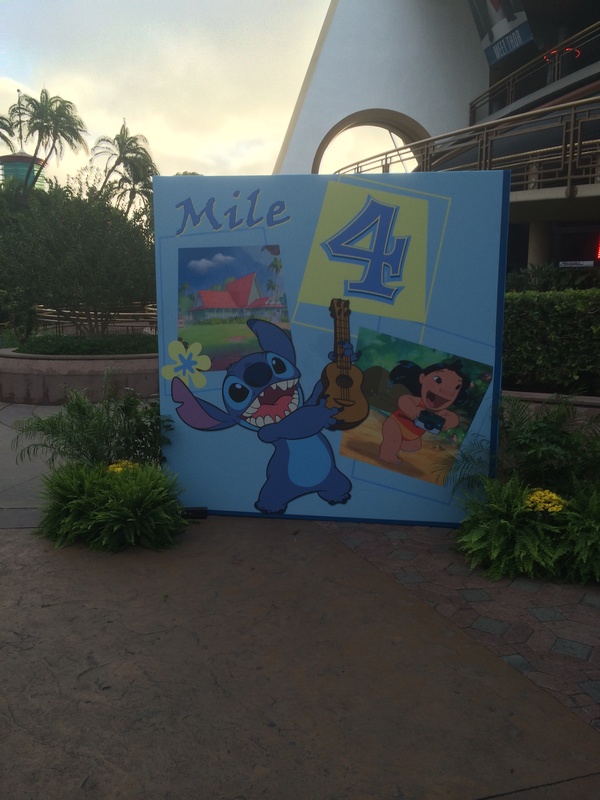 Seeing the 5 mile marker, seemed to really perk my wife up! 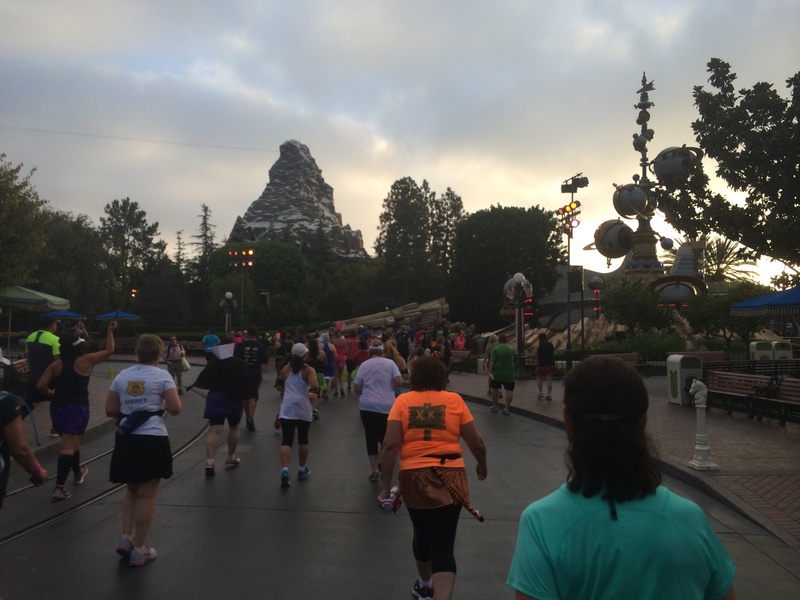 From there it was a short distance to Sleeping Beauty’s Castle. 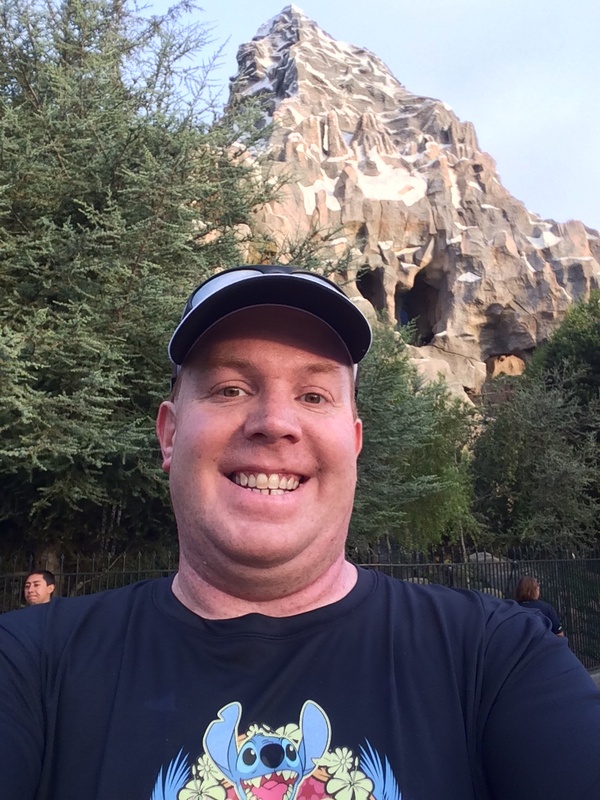 Since it looked like the Marathon Photo guys weren’t getting any pictures of me coming through the castle, I took this one at the end of the path past the castle. From there, we’d head off to Frontierland. We’d take the path all the way to the Mark Twain and the Rivers of America. 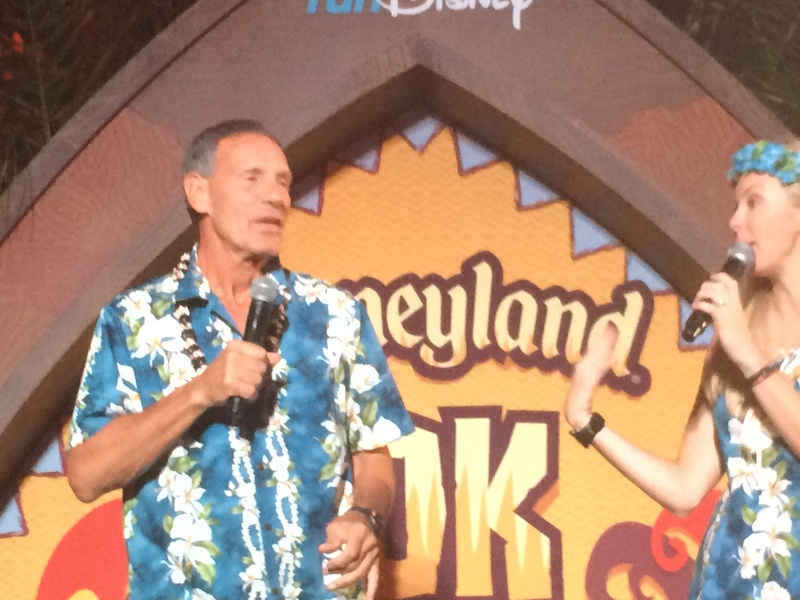 One thing that I love about the runDisney races at Disneyland is the support we get from the Disney Cast members. 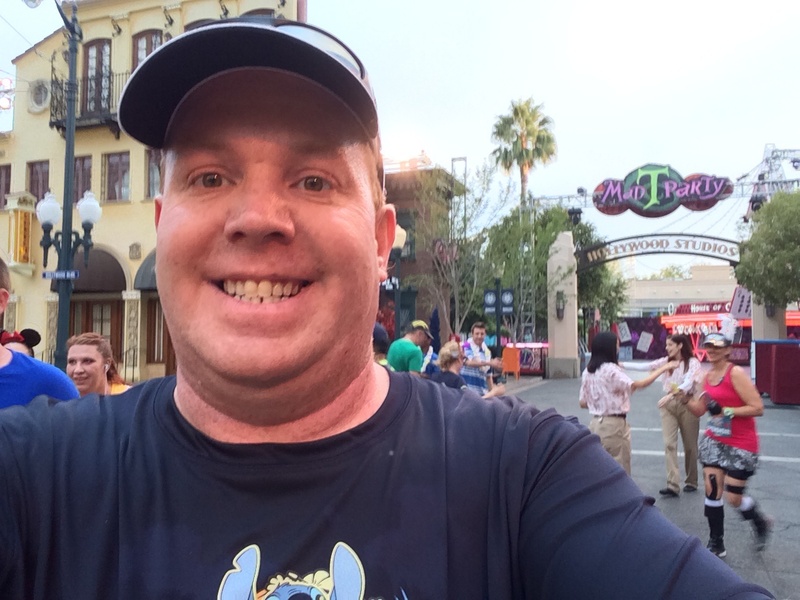 No offense to the Walt Disney World runDisney races. 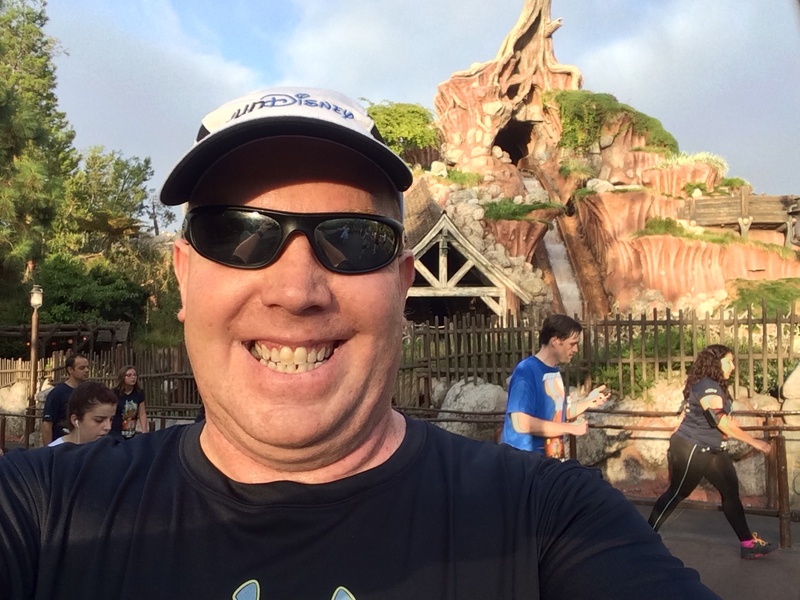 However, in my experience, it seems like the Disneyland Cast members support the races a little better and more enthusiastically than what I experienced at Walt Disney World. And into Critter Country. The picture above was from the bottom of a little hill that’s so much fun to run down. I felt bad for the walkers because those that were running here were flying. At the end of Critter Country, we would leave Disneyland’s onstage part. 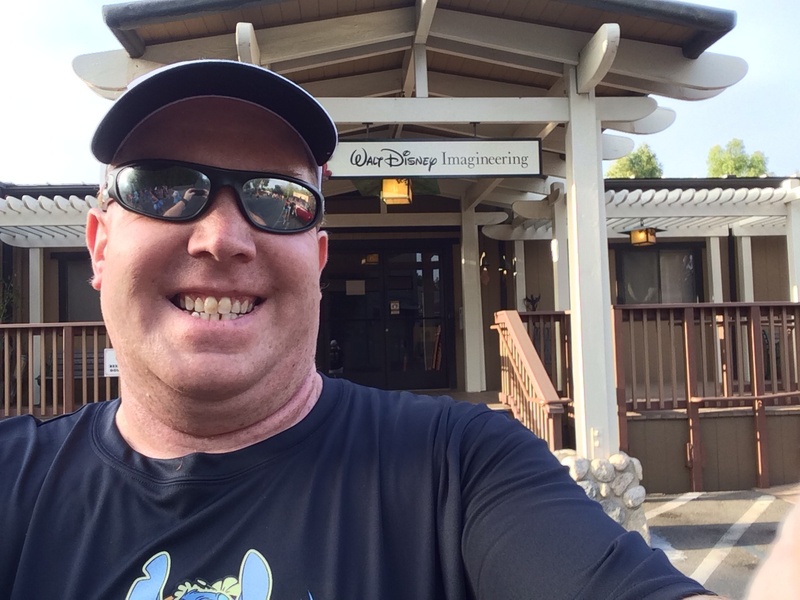 Backstage, I ran by WDI (Walt Disney Imagineering) and had to stop for a quick photo. On our way out of the backstage part of Disneyland, Brooke sprinted to high-five the Disneyland cast members. She did this earlier and I didn’t get my phone camera up and going in time to capture it. However, once I saw here sprint this time, I was ready. 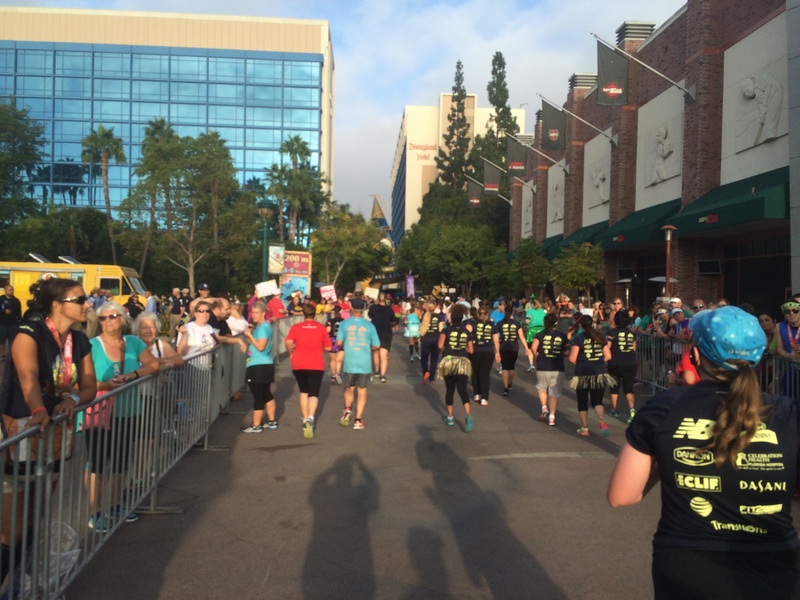 From backstage at Disneyland, we headed into Downtown Disney for the final stretch of the race. Brooke was feeling really inspired to run by the large crowds. 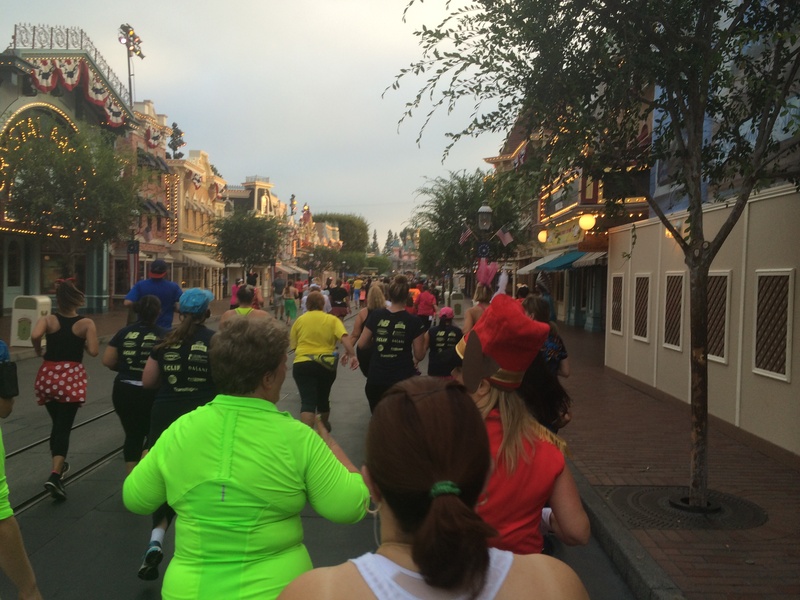 We got to run by my favorite store on the planet…the World of Disney Store. Now, the one in Florida is larger. However, I can’t go there as often as I can this one. So, the World of Disney Store in Downtown Disney Anaheim is my absolute favorite store on the planet! By the time you get to the ESPN Zone, the end is so close! 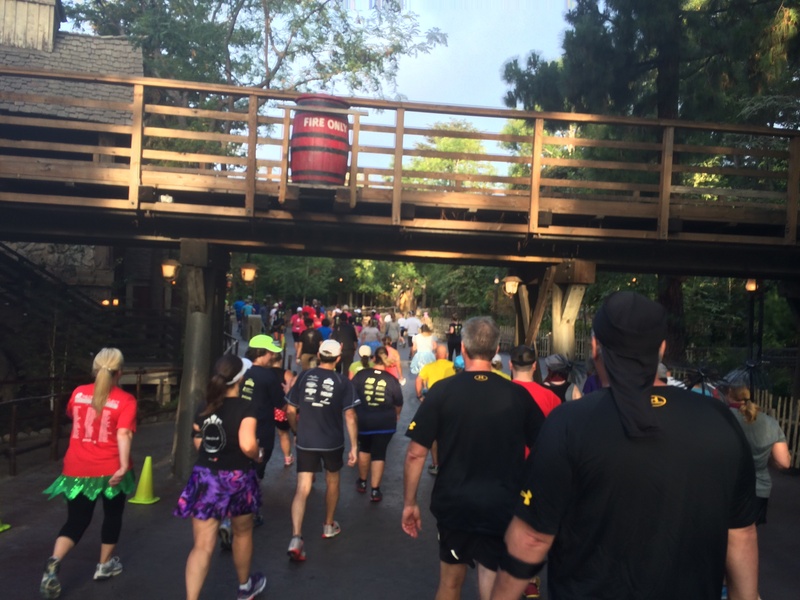 This part of the course is pretty easy to run. 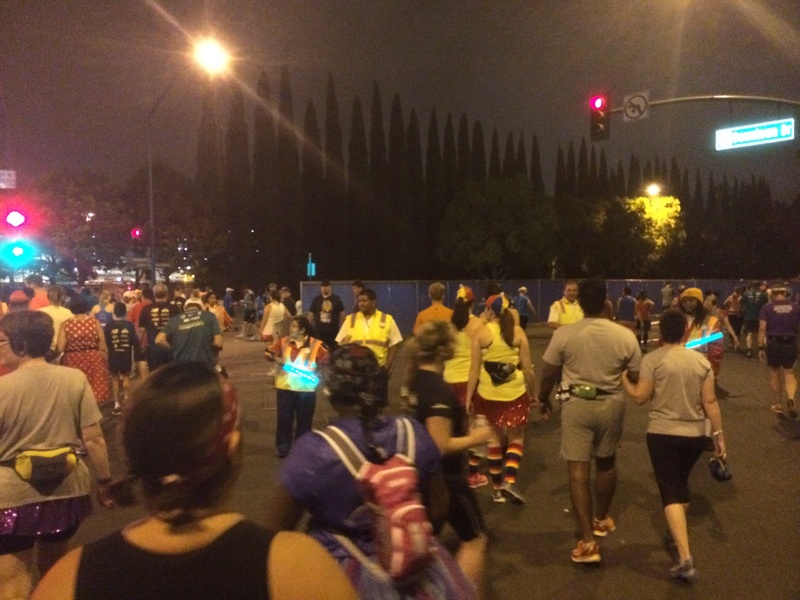 After all, the crowds are large and you can see other runners who have already finished to keep you motivated. 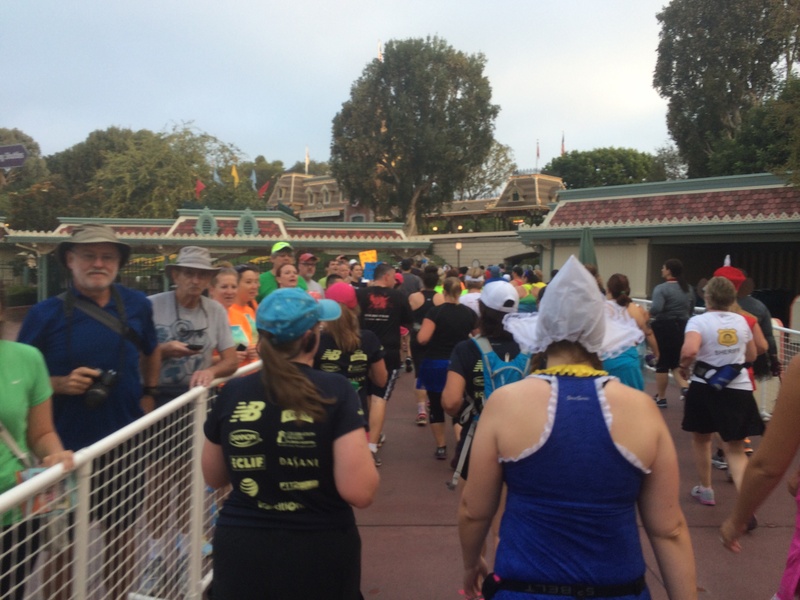 Once you pass the hat, it’s only 0.1 miles to the finish line! Close to the finish line, we passed by this sign that I’m assuming was for the kids races. The finish line! 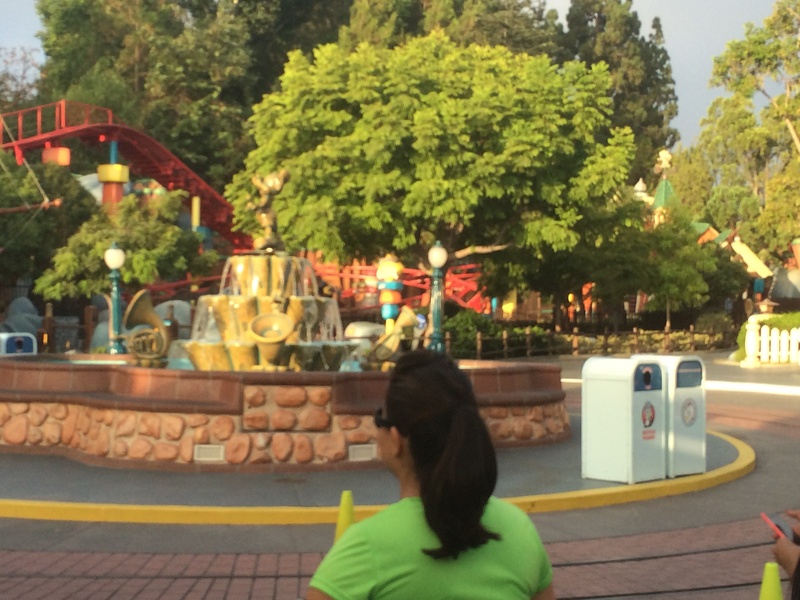 Once I saw Goofy, I sprinted ahead of Brooke to get a high-five before crossing the finish line. Goofy wasn’t quite prepared for that. However, Donald Duck saw my give Goofy the high-five and immediately pointed to his hand to get one for himself. Of course, I obliged. As of this writing, there isn’t a photo of this which bums me out a little, I have a picture that looks like it was a second or two after I passed Donald. Oh well. You can’t always get the magic photo. 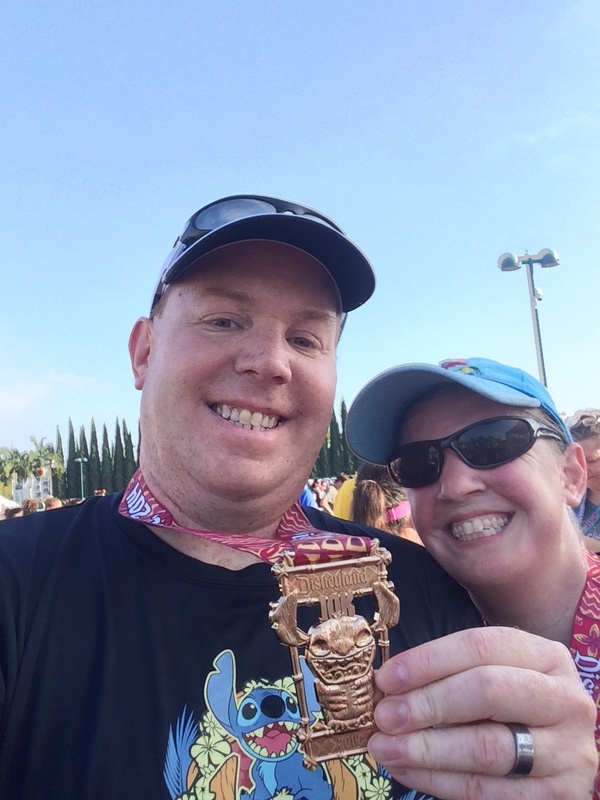 After we crossed the finish line, we were both really happy to be finished! As we approached the volunteers who gave out the medals, Brooke and I decided to take pictures of each other getting our medals. Here I am getting mine. 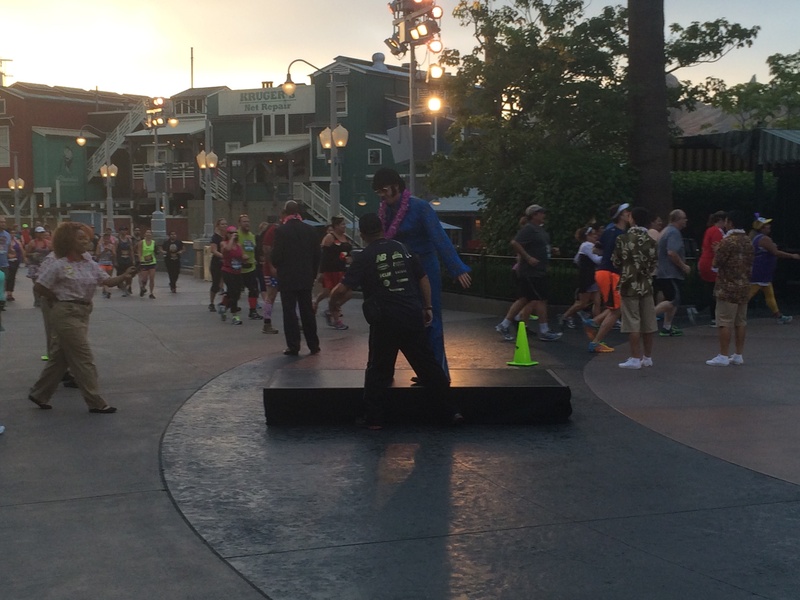 I then made my way to get the wrist band I’d need to get my Dumbo Double Dare medal the next day. 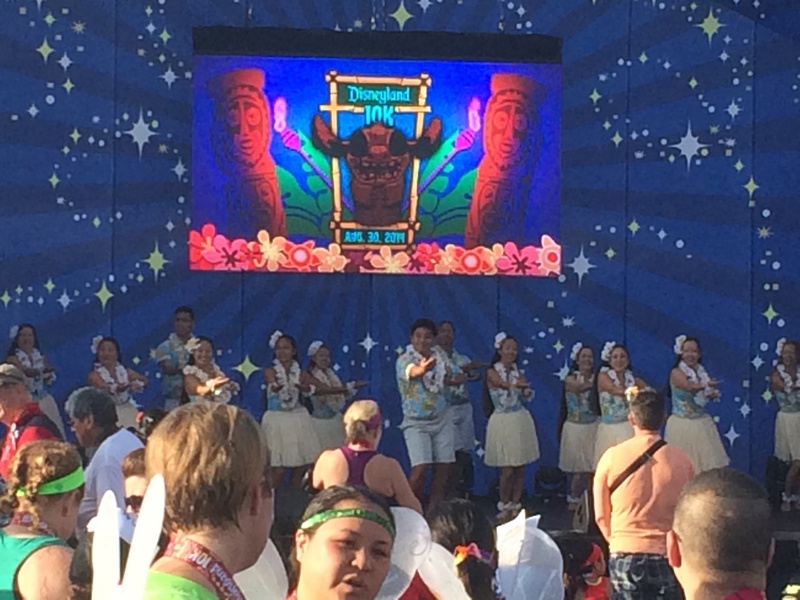 In the post race, family reunion area, they had hula dancers to entertain us. All of that keeps with the theme of Lilo and Stitch. 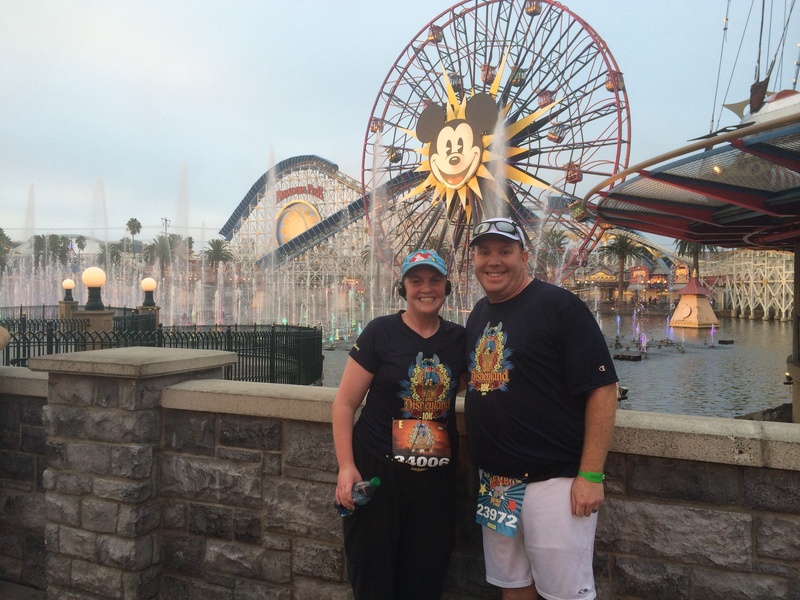 Disneyland 10K Finishers! Brooke’s race weekend was over. Mine still had another day. 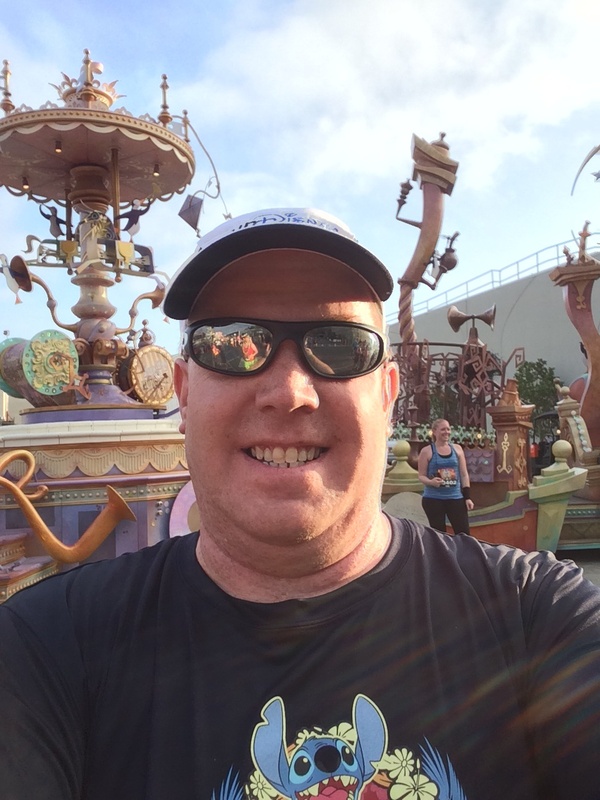 Race number 1 of the Dumbo Double Dare was in the books. 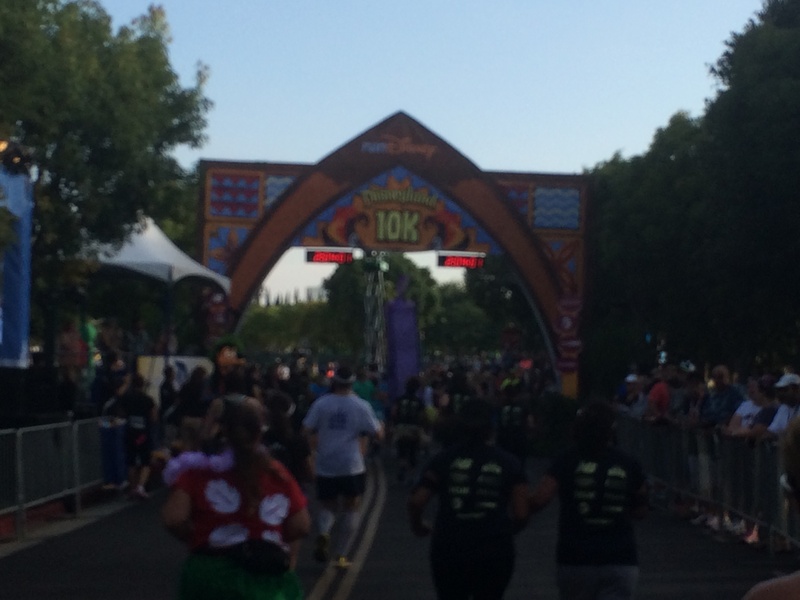 We finished in 1 hour 33 minutes, 40 seconds…a 10K PR for Brooke! I’m so proud of her for this accomplishment. 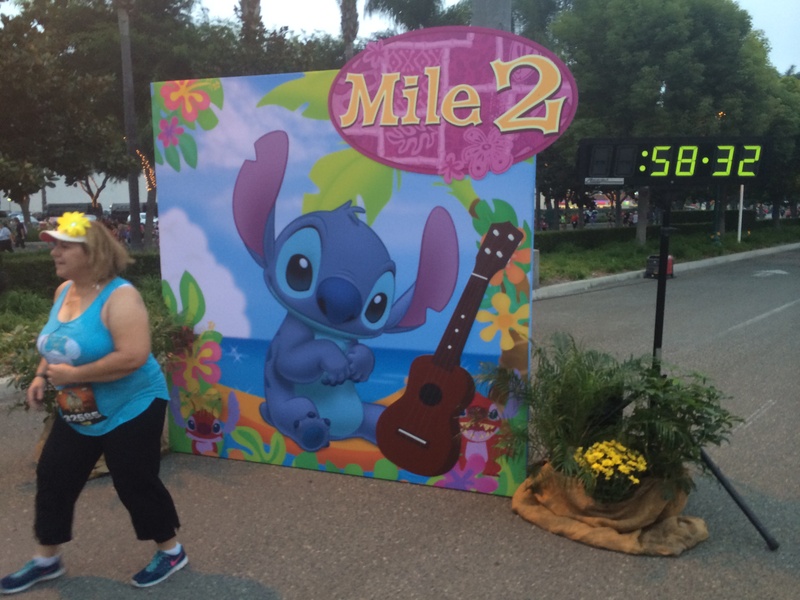 At the end, she was pretty surprised with her time because it felt slower than last year for her. The day didn’t there, but this blog post will. 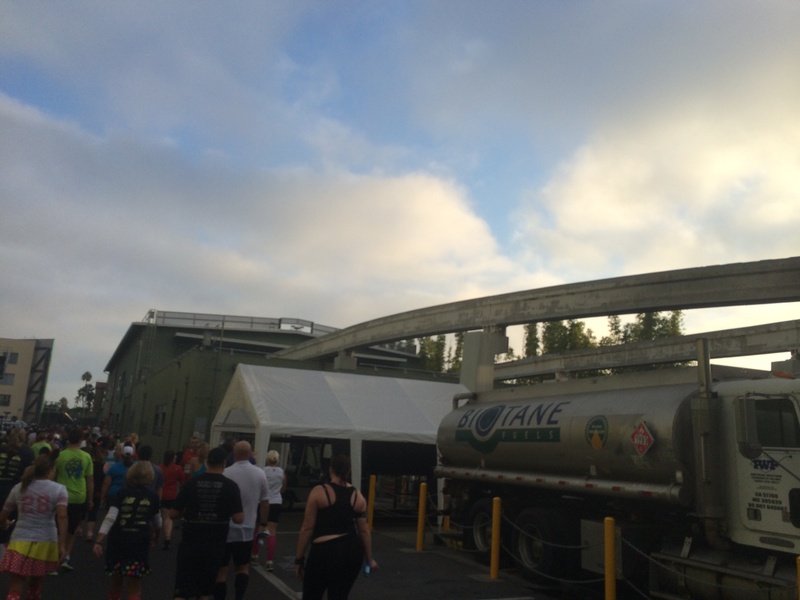 Kudos to runDisney for adding water stops from last year. It was much appreciated. 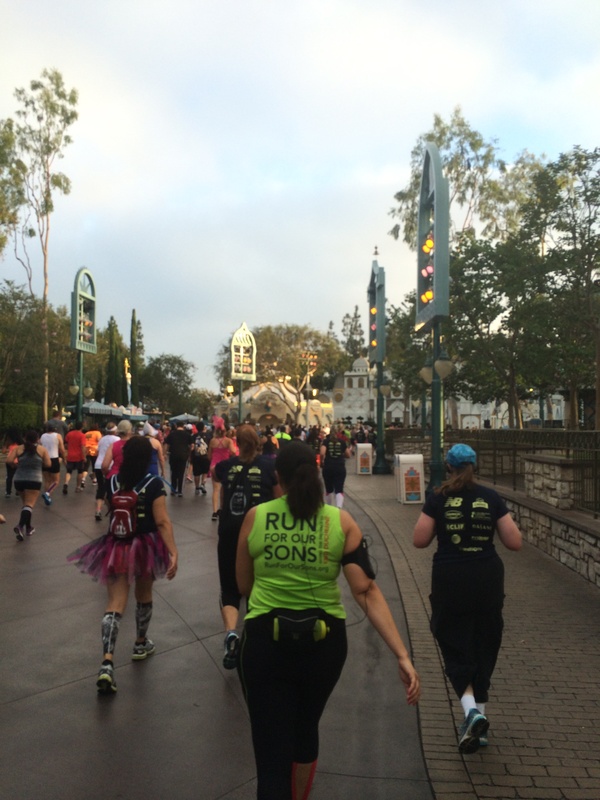 Kudos to runDisney for placing the Disneyland 5K on Friday this year. 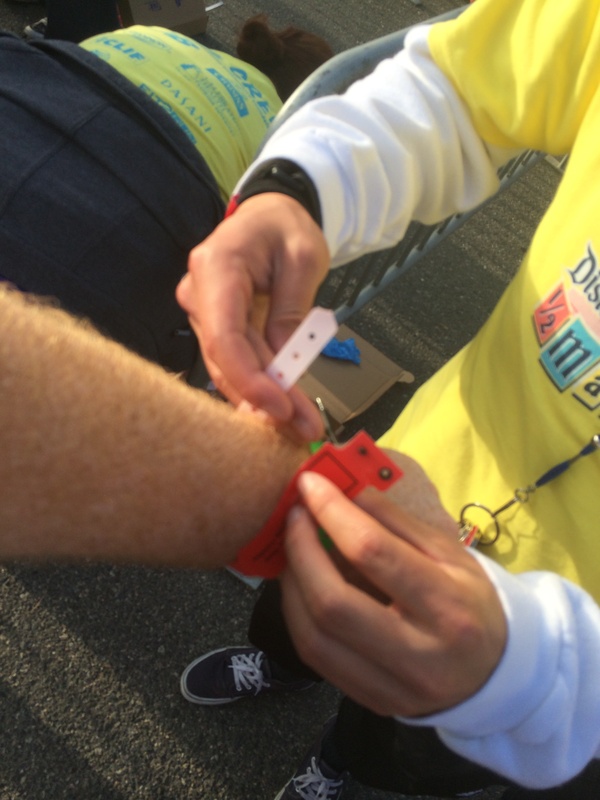 It really helped get everyone get into their corrals without all the craziness of last year. I LOVE this course! It’s so much fun to run! The only negative for me was lack of Character photo ops this year. Last year there were more characters on the course. 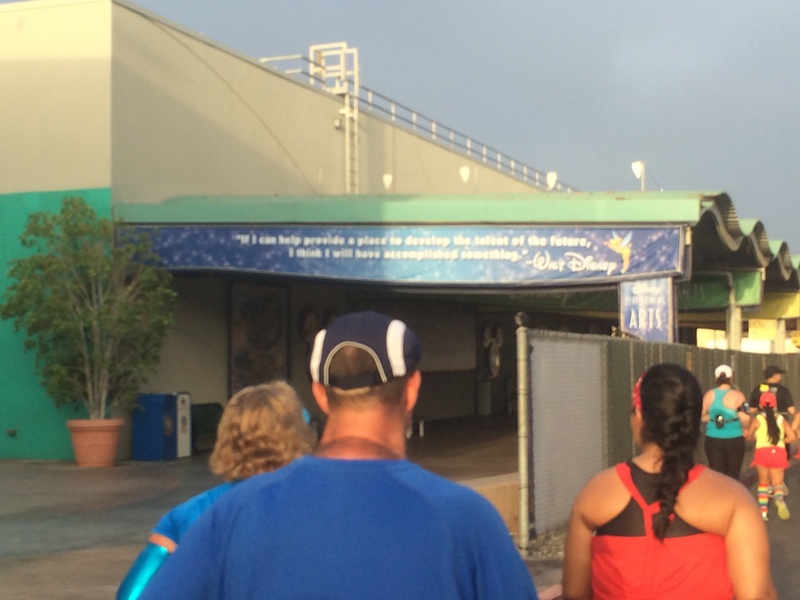 Hopefully, runDisney will correct this for next year. 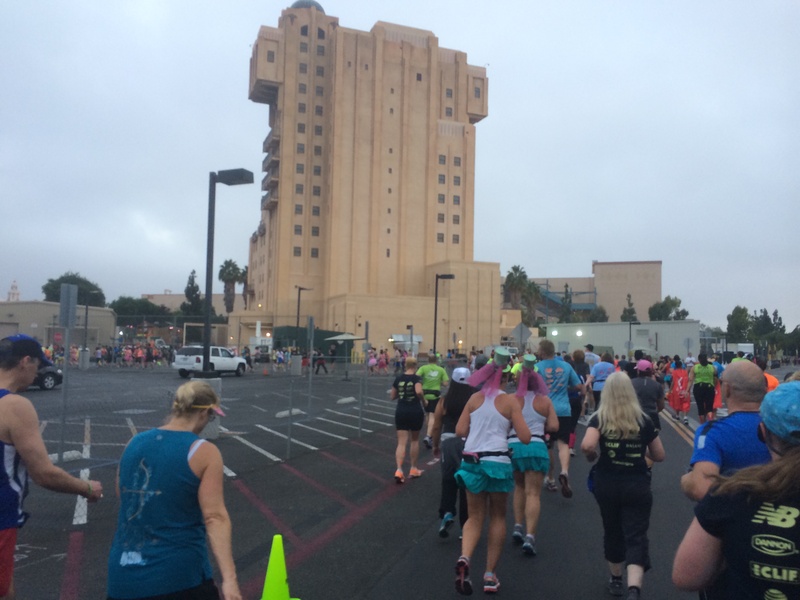 Staying at the Disneyland Hotel is the perfect hotel for the Disneyland Half Marathon races! So, did you run this year? 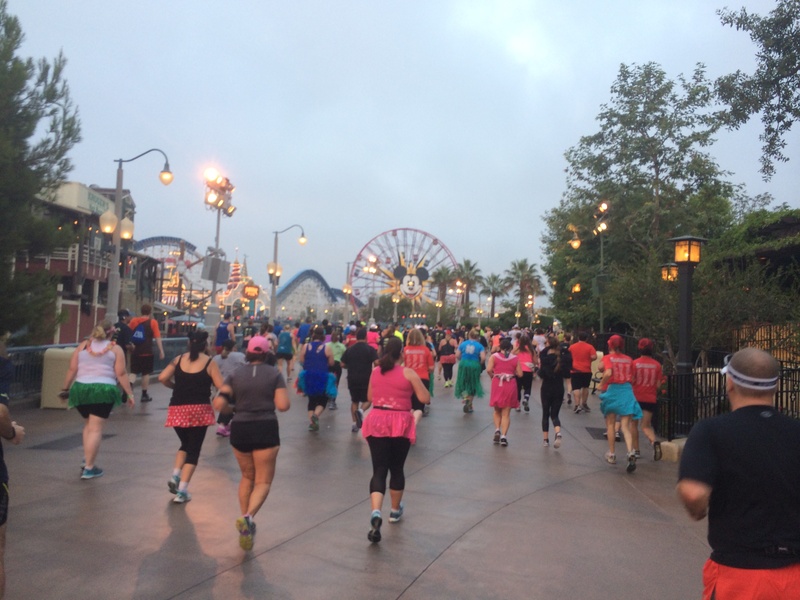 What did you think of the 2014 Disneyland 10K race? great recap! I am so glad we got to hang out a bit on Saturday and Sunday! and I so agree that the course was lacking pics but I still had a good time. and congrats to Brooke on the PR! It was cool to see you outside of being in the middle of a run! 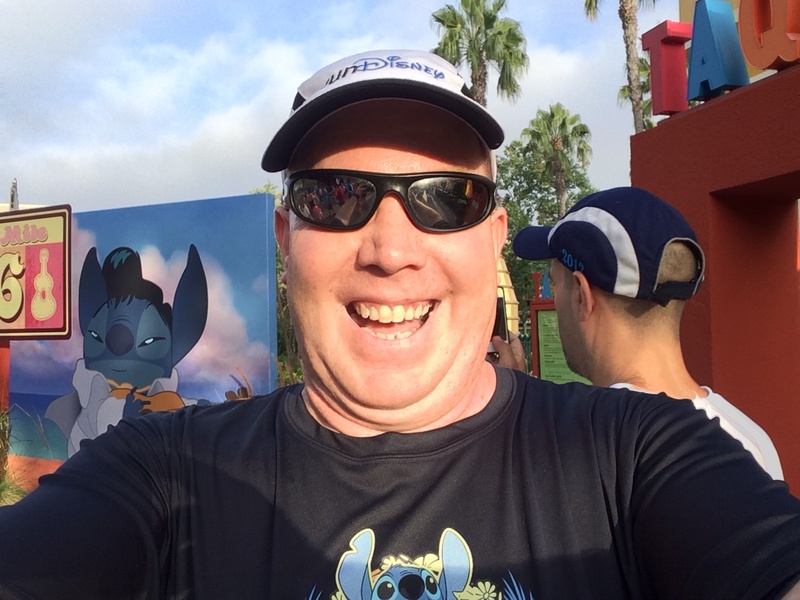 Feel free to link up to my post on the DL 10K. I was taking my time during the 10K, so I could get some good pictures. The benefits of going slow.